Dear Readers, a few weeks ago I discovered, to my astonishment, that London is home to several peat bogs. What on earth are they doing here? I associate them with the bleak, wet, windswept north-western coast of Scotland, or with parts of Ireland. But as I read further, I found that peat bogs were once widespread across the whole of the country. However, as land has been drained for building and for industry, and as the peat was dug out for fuel and latterly for compost, these habitats have dwindled to a few sites. 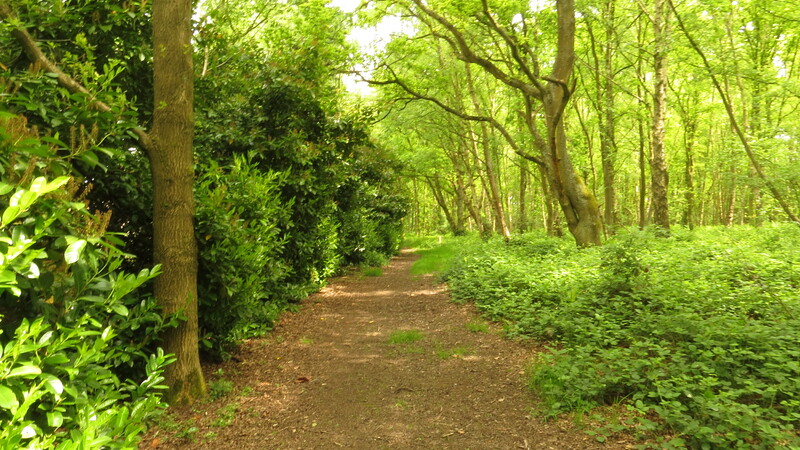 The best are in the south of the capital, but on Bank Holiday Monday I decided to explore the bog closest to my home patch, Rowley Green Common at Arkley in the London Borough of Barnet. This tiny patch of bog is said to be home to Star Sedge, Nodding Bur-Marigold and Lesser Spearwort, although this early in the year I was not holding my breath. You would think that a bog would be a fairly easy thing to find, if only because you would suddenly find yourself up to your knees in mud. But no. 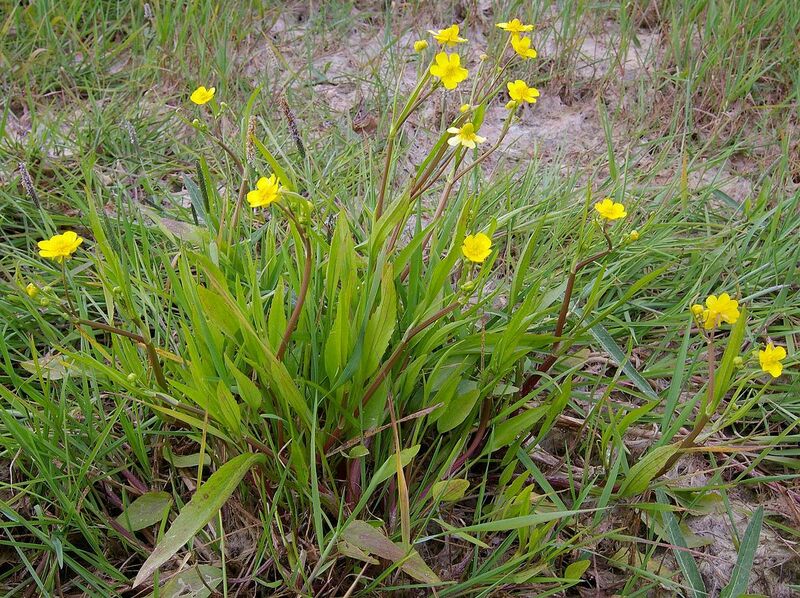 There is a problem in this nature reserve, and it is that the areas of bog are gradually being colonised by other plants, like willow saplings for example. Still, there are some open, boggy areas if you follow the less-trodden paths. I love bogs: there is something about their claggy serenity that piques my imagination. I would not be surprised to see a green figure made entirely of sphagnum moss emerge from the sediment and dance amongst the reeds. However, he would have a problem here, there being no obvious sphagnum moss at all. 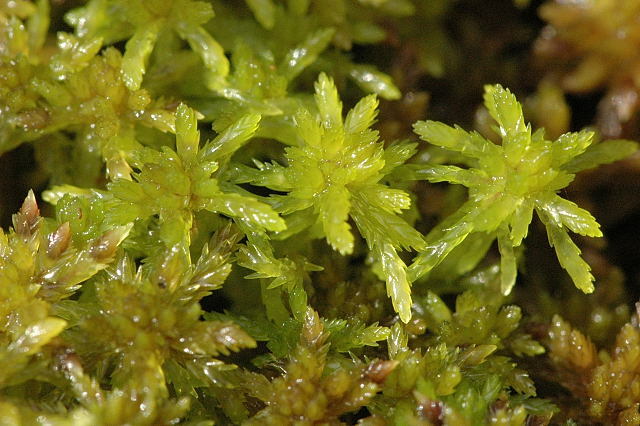 Sphagnum moss is the building block of a bog. As you might remember from a previous post about moss, it can absorb large quantities of water, like a sponge. This helps to keep the water table high, normally making bogs wetter than their surroundings. Layers of moss and other water plants grow on top of the sphagnum, and the lower layers slowly decay and turn into peat, at a rate of only two millimetres a year. 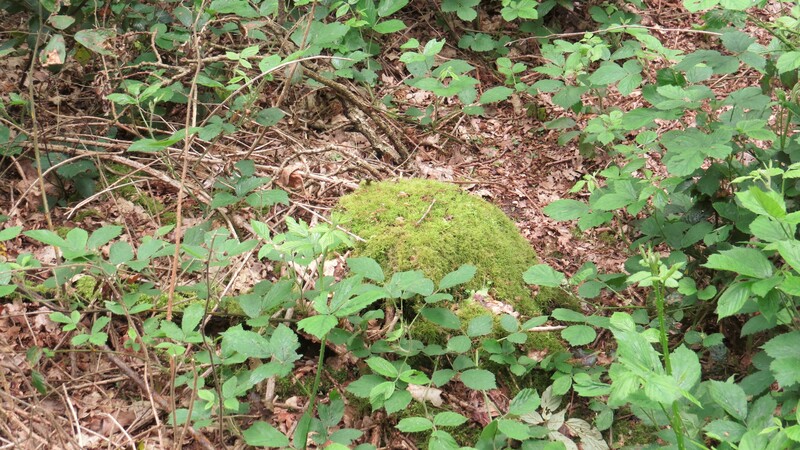 The mossy mounds that we see in bogs are a result of this process. Here in Rowley Green, I saw only one such mound, stranded high and dry amongst the brambles, though there were probably more hidden from view. In the past, the boggy area here was much larger – until World War Two the area was kept open by grazing cattle, preventing the encroachment of the scrub and forest. 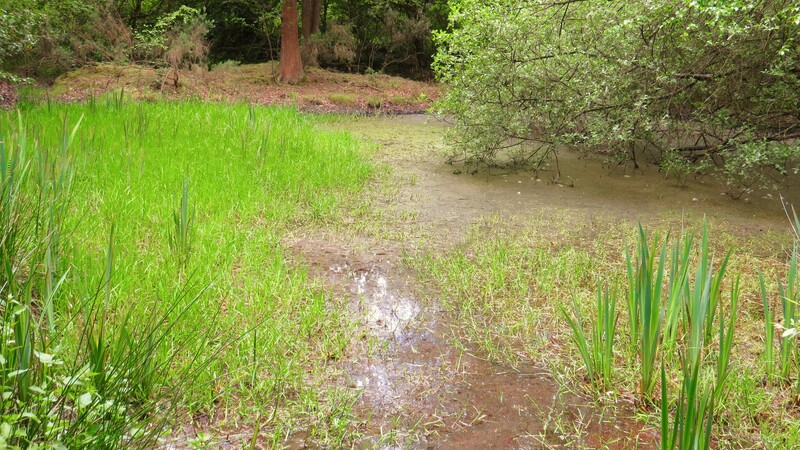 Small-scale gravel extraction also opened a series of ponds, which helped with the boggy environment. 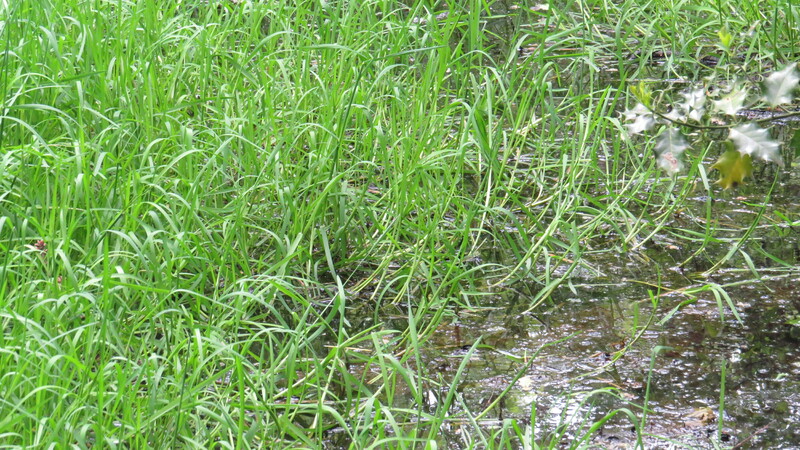 But now, this little patch of wetland is under siege on all sides. To one side, there is a golf-club, with a huge, dark cherry-laurel and rhododendron hedge along the boundary with the reserve. 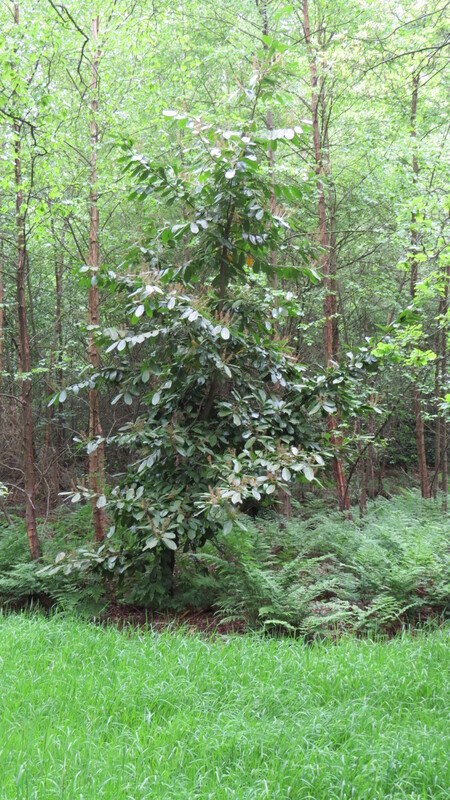 Furthermore, there is a huge rhododendron growing right in the middle of one of the boggy areas. We tend to think that forests and bogs and heathlands can be left to look after themselves, but most kinds of habitat have a desire to move on. Every pond, in its heart, wants to become a bog. Grassland wants to become a forest. The only reason that it doesn’t is because there is some resource constraint or very particular environmental factor, or because humans intervene. 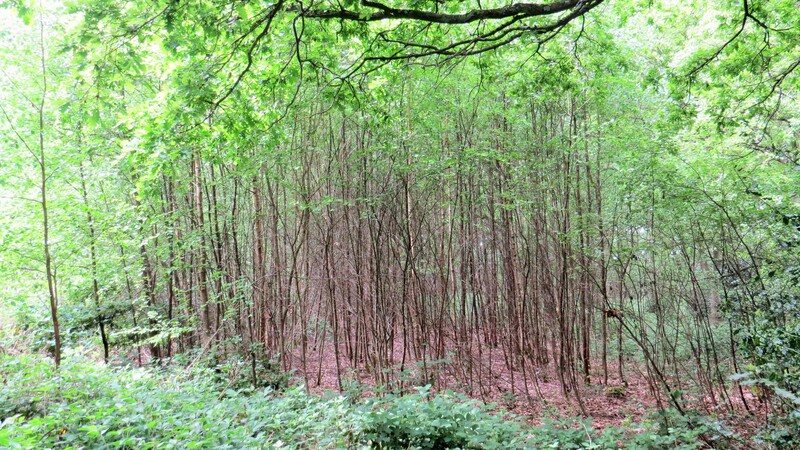 In Coldfall Wood, coppicing has changed the environment and increased the number of species that will survive. Here in Rowley Green Common, it will take some active management to make sure that this little bog doesn’t disappear altogether, along with the unusual species of plant and invertebrate that depend on it. 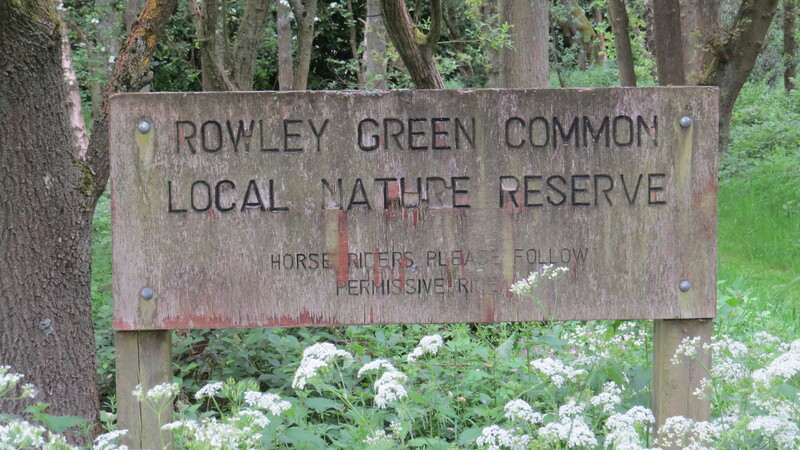 It reminds me of the importance of local Friends groups who keep an eye on their local wild spaces – Hertford and Middlesex Wildlife Trust seem to have Rowley Green as part of their remit, but they have a huge area to look after. In all our time at the reserve, we didn’t see a single other person. 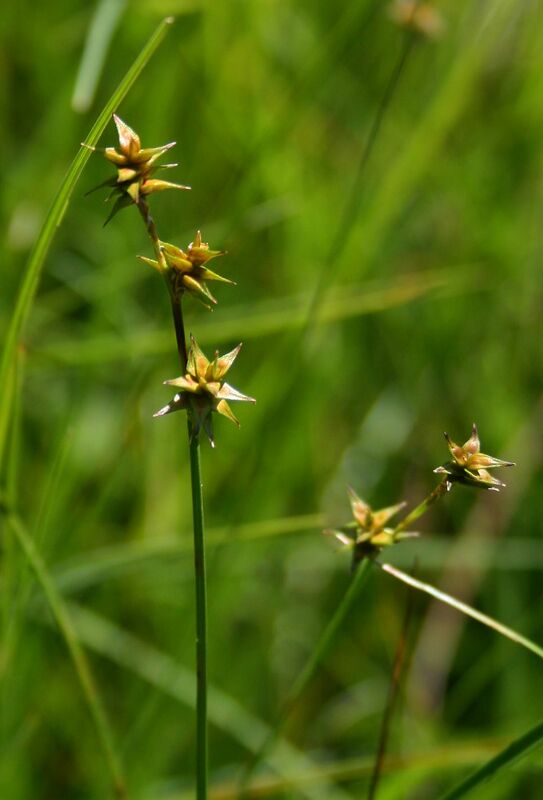 Ironically, although an unvisited reserve may be good for the plants and wildlife, it might also mean that no one cares enough to save it when things start to go wrong. And surely the only peat-bog in Barnet is worth saving. To read more on the Peat Bogs of London, have a look at this excellent piece by the London Wildlife Trust. 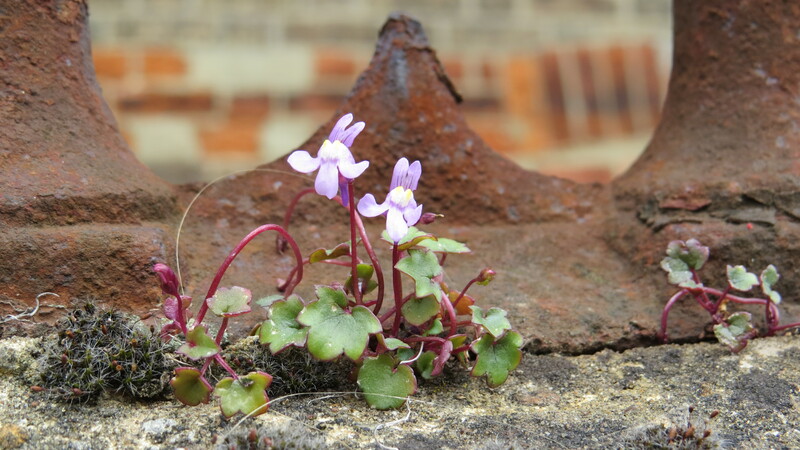 This entry was posted in Bugwoman on Location, London Places, London Plants on May 30, 2015 by Bug Woman. 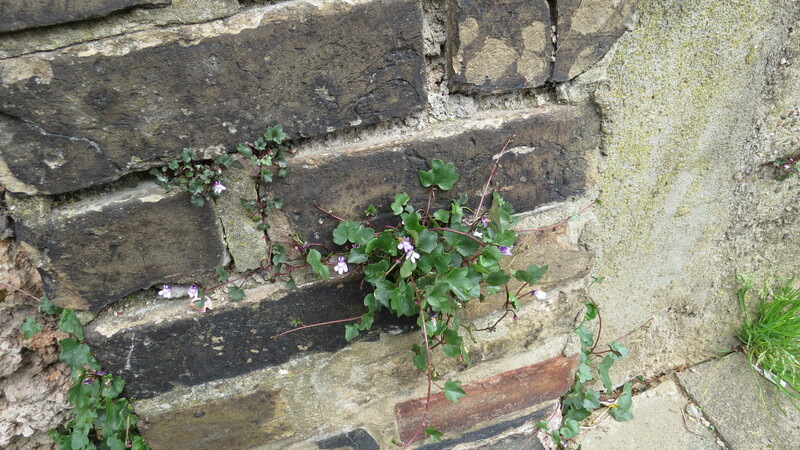 Of all the things that grow in our cities, I have a soft spot for the ones that make their homes in walls. There’s something about these plants, clinging onto life in such a dry, sun-baked, inhospitable situation that fills me with admiration. 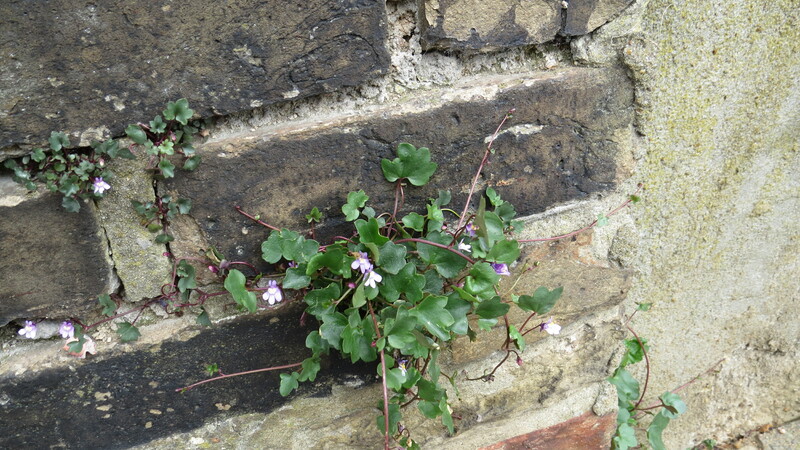 On Sunday, I found a whole wall full of Ivy-leaved Toadflax. 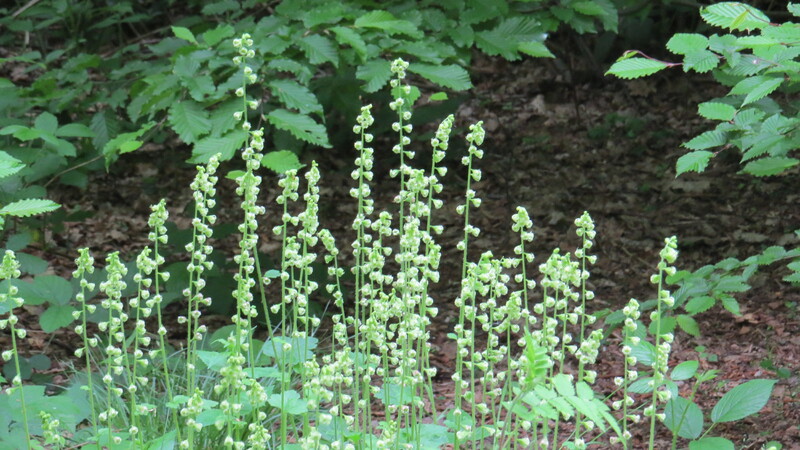 Tiny plants were growing on the top and then seeding right down to the bottom, like a kind of botanical candle-wax. Once I got home, I started to do some research and discovered, to my delight, that the plant is designed to do just this: when in flower, the blooms turn towards the light, but once the flowers are over, it becomes ‘negatively phototropic’ – in other words, the seed heads bend away from the light, to deposit their seeds into darker places, like cracks or the shadow at the bottom of a wall. 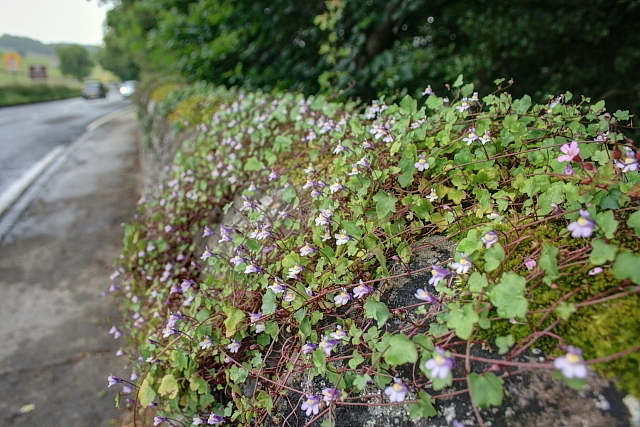 When I find out something like this, I want to rush out into the street, stand by a patch of Ivy-leaved Toadflax and tell everybody who passes about what a fascinating plant it is. Fortunately, my blog enables me to do this without being arrested. 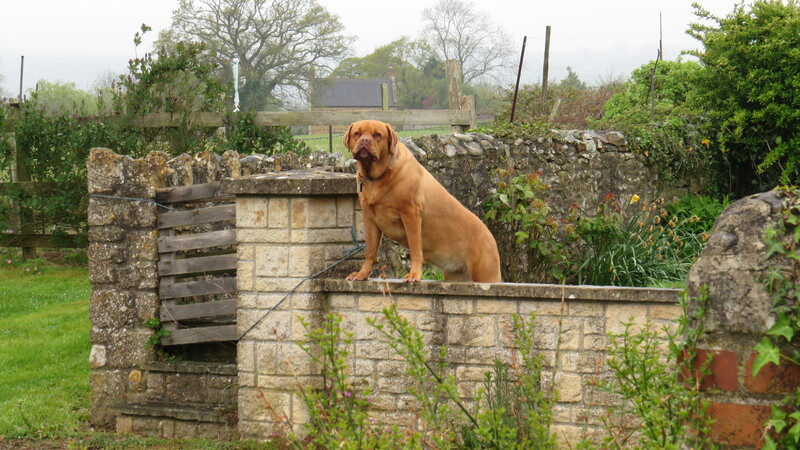 On the top of the wall…. ..at the bottom of the wall. 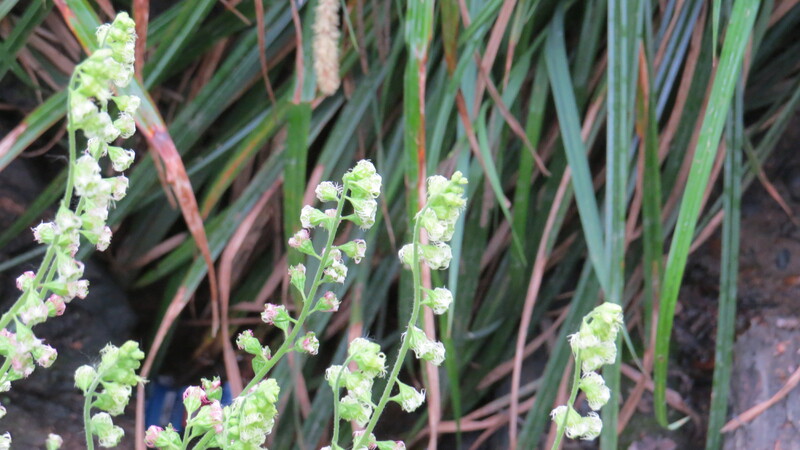 Toadflaxes are a member of the Figwort family, which also includes such plants as Mullein, Foxglove and Antirrhinums. 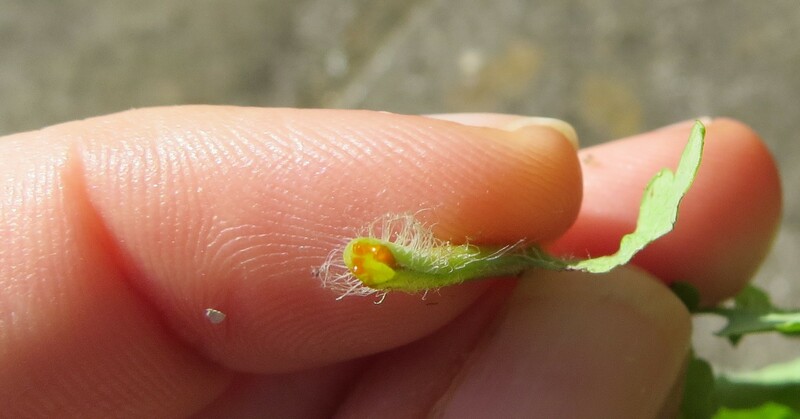 However, the trick to identifying a toadflax is to look at the lower ‘lip’ of the flower – this is called the Palate (because it guards the ‘throat’ of the flower), and is formed of two lobes. The plant seems to like the scabbiest, most broken-down walls, maybe because these contain the greatest variety of crevices and cracks. 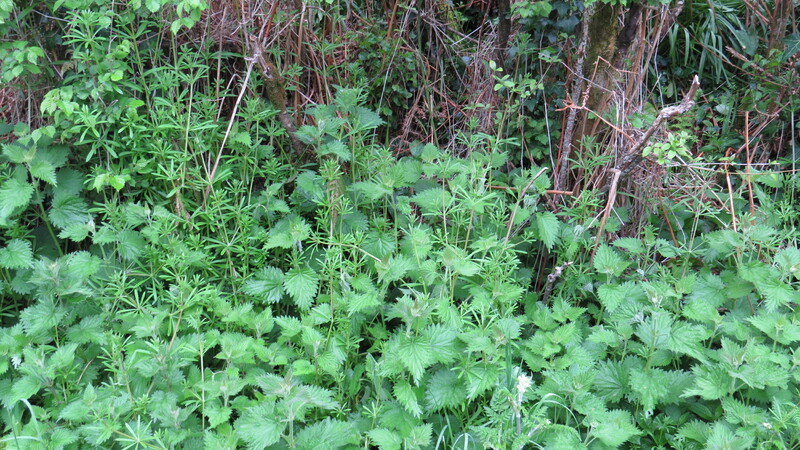 Richard Mabey notes that it is ‘virtually unknown in natural habitats in this country’. 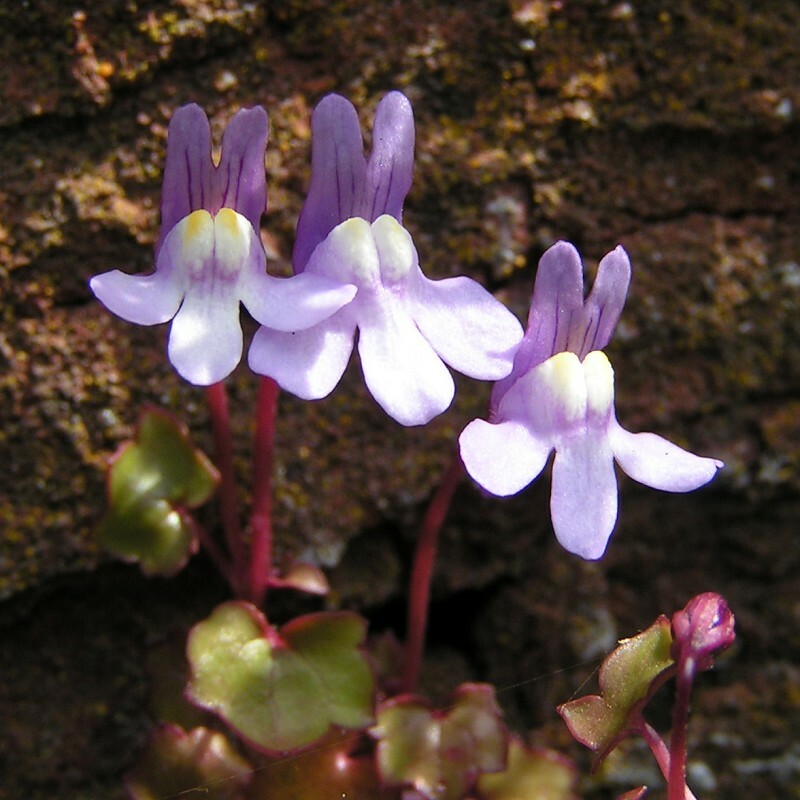 In its native Italy, Ivy-leaved Toadflax is known as ‘the plant of the Madonna’. 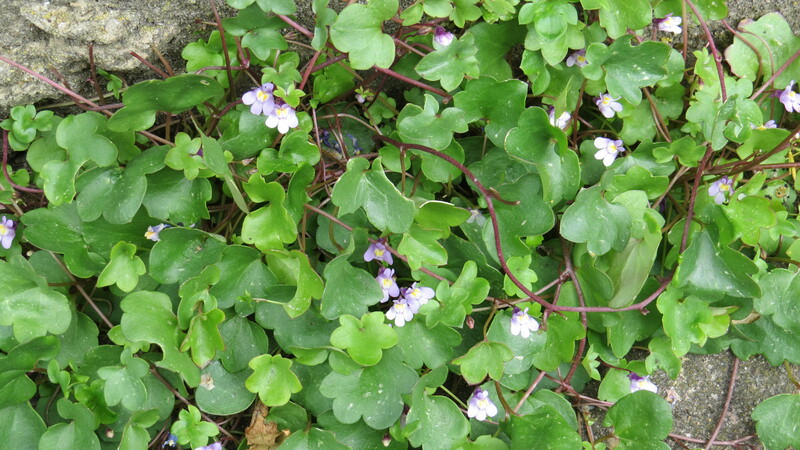 It is also said to be edible: it is described in old herbals as ‘anti-scorbutic’, which means that it is high in vitamin C, and has been eaten in salads. Its flavour is described as being similar to cress. I can imagine that those little flowers would look very pretty too, although taking them would mean depriving the bees of their nectar – like most plants with ‘snapdragon’-shaped flowers, it is insect-pollinated. This leaves me with just one question. 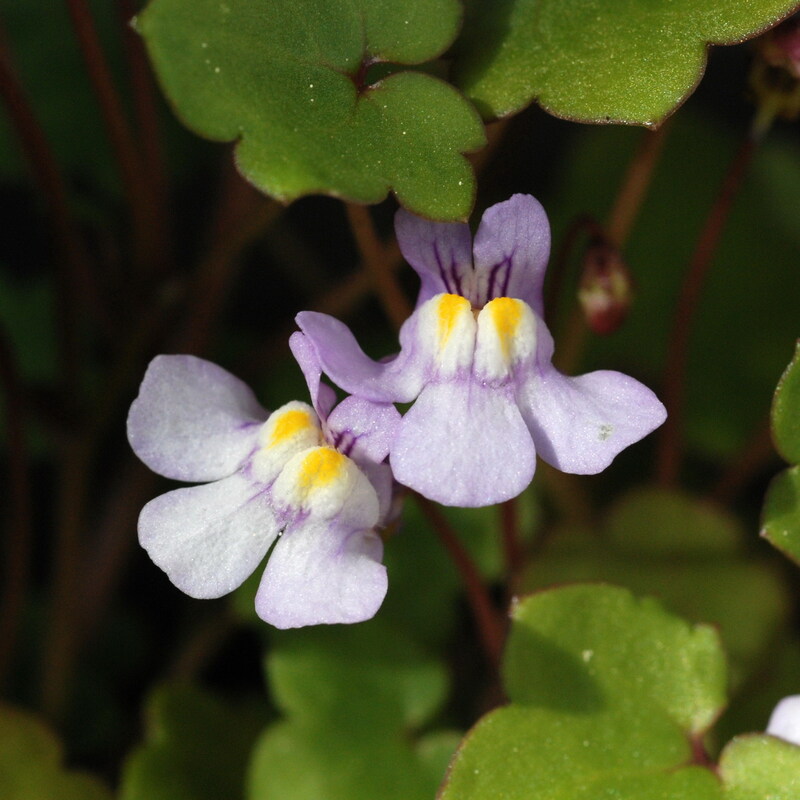 Why is a Toadflax called a Toadflax? The answer is lost in history, but one explanation is that the flower looks like the wide-mouthed face of a toad. Another is that the flower looks like a whole toad! There is also a theory that toads liked to shelter amongst the leaves, which, as they also like the crevices in drystone walls, seems to me the likeliest of the explanations. 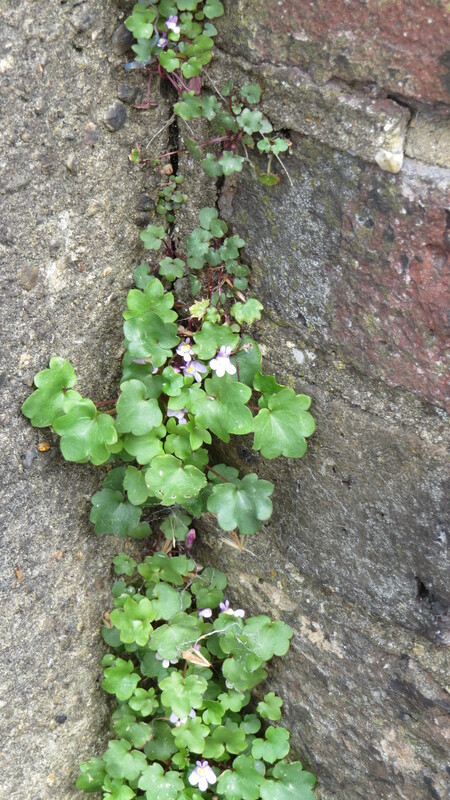 At any rate, having noticed Ivy-leaved Toadflax, I am now seeing it everywhere, and will certainly tell you if I spot any toads. 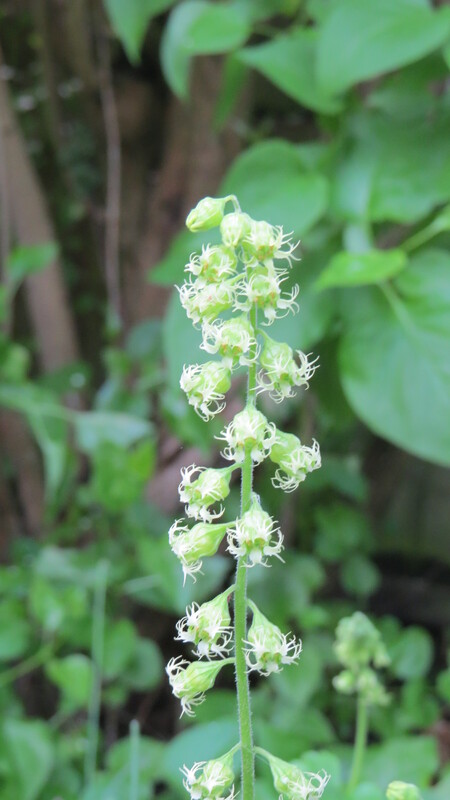 This entry was posted in London Plants on May 27, 2015 by Bug Woman. Me aged about four with my nan. Dear Readers, I grew up in Stratford, in East London. Five of us crammed into a two-bedroom house with an outside toilet, no bathroom, and a pocket handkerchief-sized garden. And yet, it was that little garden which first triggered my interest in insects. I spent hours digging in the dirt with spoons that I’d smuggled from the cutlery drawer. I reared woolly bear caterpillars in a plastic box, tried to create woodlouse habitats under concrete slabs and marked the backs of passing ants with watercolours from my paintbox. 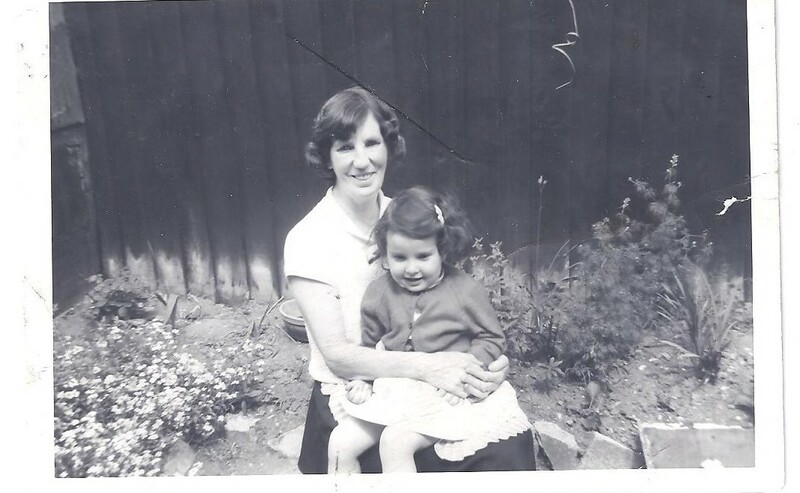 I was a permanently messy child, with scuffed knees and dirty fingernails, in spite of the attempts by my mum and nan to keep me more or less lady-like. 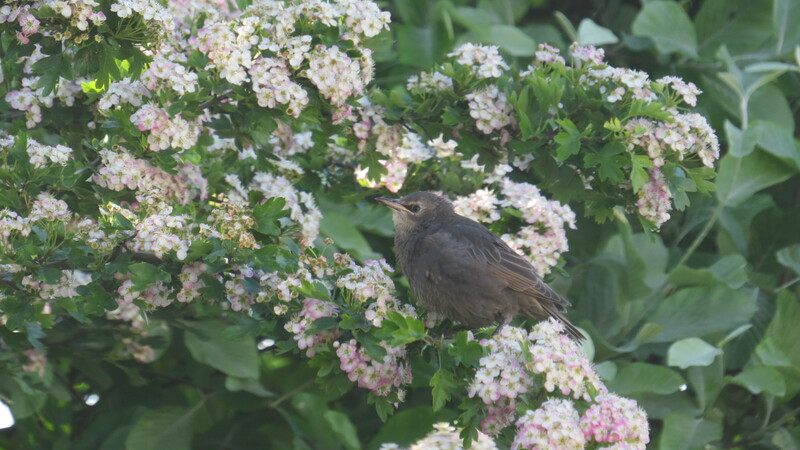 In a way, I was a pioneer of wildlife gardening before the term had even been invented, because the more invertebrates there were in the garden, the better I liked it. Once, I rescued some milky, sticky eggs that I found and put them into the damp course under the living room window. When we were suddenly inundated by enormous yellow slugs a few weeks later, I kept very quiet. As I grew up, I didn’t have much access to a garden. I was in student digs, and then in a variety of rented accommodation. Some people seemed able to create a floral paradise wherever they were, but not me. I was always on the move, always too easily distracted. A bout of serious depression in my thirties didn’t help. For a while, I had a few pots on a first floor balcony and got most of my access to nature from the community garden down the road. And then, in my fifties, we moved into our house in East Finchley, and things started to change. For the first time, I could settle down, with a garden of my own. It felt safe, finally, to become a gardener. When we moved in, our house had a very typical family garden – rectangular lawn, patio, shed. But I wanted so much to turn it into something that was friendlier for wildlife. We don’t have children, and so there was no need for somewhere to play football or badminton. We decided that, as this is the kind of thing that we would only do once, we would get someone to help us with the design of the garden, and with the heavy work of digging out a pond to replace all the grass. I figured that if the garden had ‘good bones’ it would be more difficult for me to mess it up. I am still a novice, trying things out, messing things up, forgetting to do things and doing them at the wrong time. But, thankfully, nature is very forgiving. 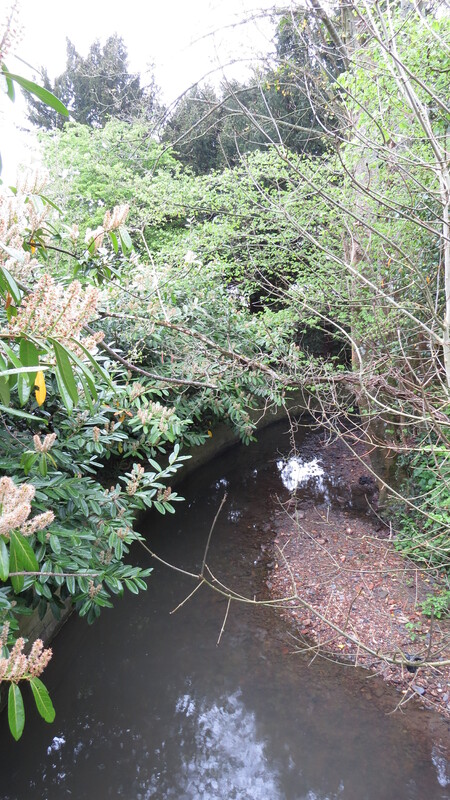 The plants on the left hand side of the photo above were already there when I moved in – white-flowering lilac, hawthorn and whitebeam. How lucky I am to have some mature trees! However, the garden is north-facing, and as the trees grow, the area underneath becomes increasingly shady. 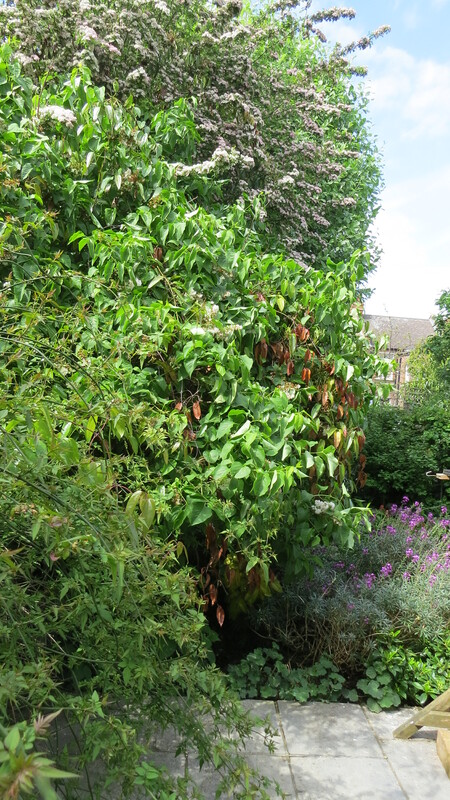 In particular, the lilac has turned into a monster, almost a small glade of trees in its own right. 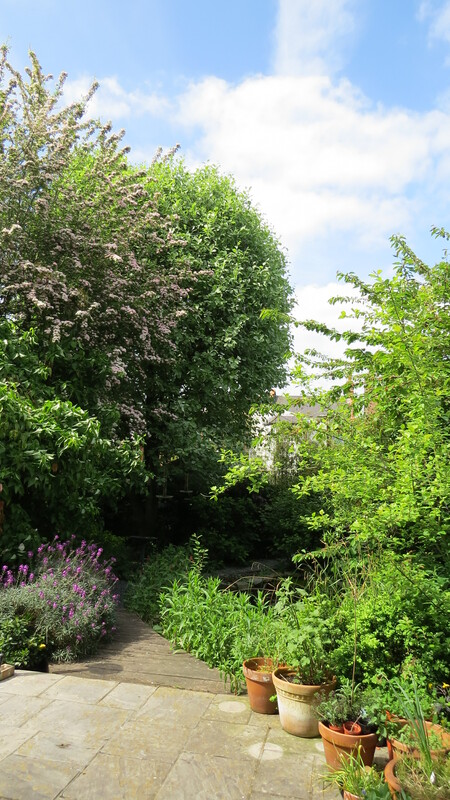 It has an evergreen, white clematis scrambling through it, which provides some sustenance for early Bumblebee queens, but I’m sure I could do more. 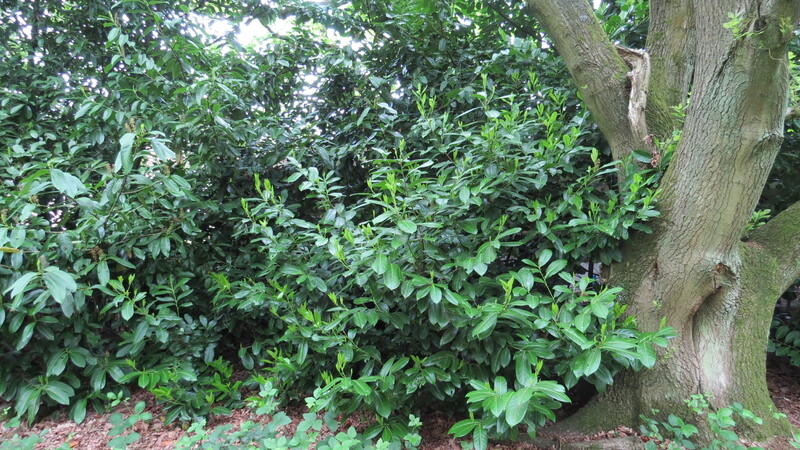 Does anyone have any experience of renovating such an august shrub? I know that if I’m going to try to help it renew itself, it needs to be right after flowering, so I’d better get a move on. 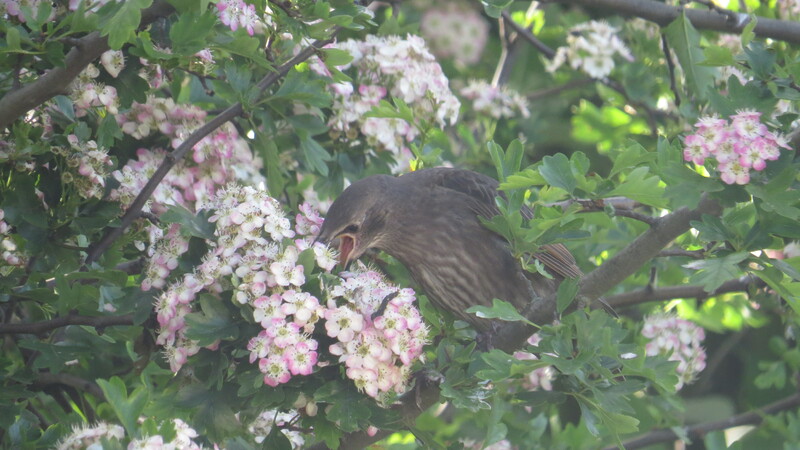 The hawthorn is attracting a mass of insects and small birds, who spend best part of the day pecking through the flowers for caterpillars. 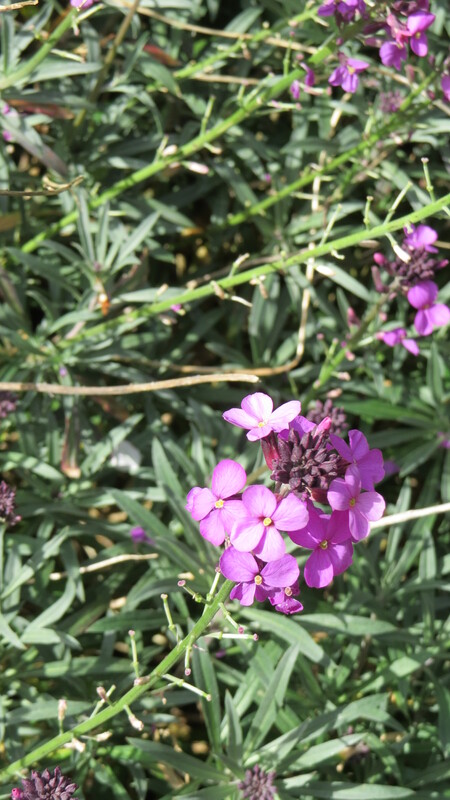 One of the plants that works hardest in the garden is the Bowles Mauve perennial wallflower. I put it in over three years ago. In all that time, there hasn’t been a day when there hasn’t been at least a few flowers on it. Bees of all kinds seem to love it, it needs no care, and my only fear is that at some point it will run out of steam. 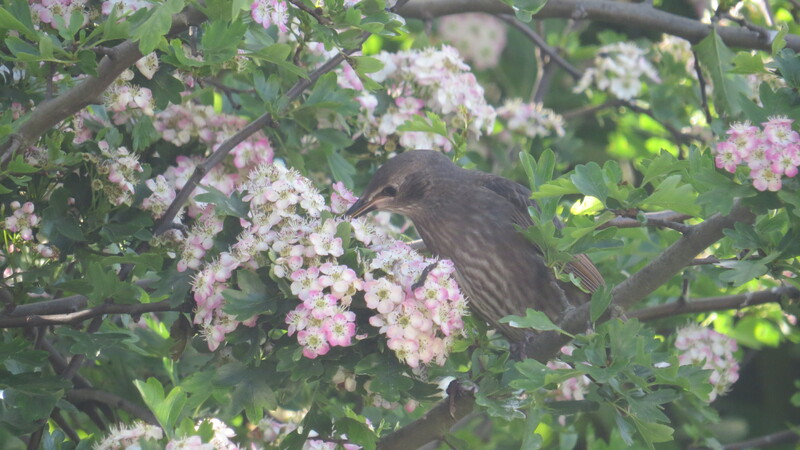 In the meantime, I appreciate its generosity every day when I look out of my kitchen window. 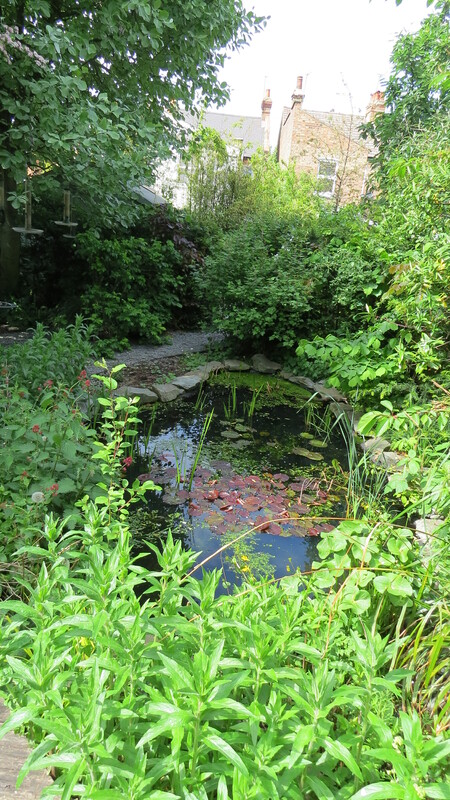 The pond is the single most interesting thing in the garden. Frogs lay their eggs in it, dragonflies and damselflies hover over it, water boatmen swim in it and everything drinks from it, from foxes to blackbirds to dunnocks to a wide range of neighbourhood cats. There is always something going on. It has reached a stage now where, provided we remove most of the leaves and excess water plants in the autumn, it is self-maintaining. If you have any space at all, even a balcony with room for a bucket, I would recommend putting in some water. You will be amazed what turns up. Another picture of the pond. Can you tell I’m in love? 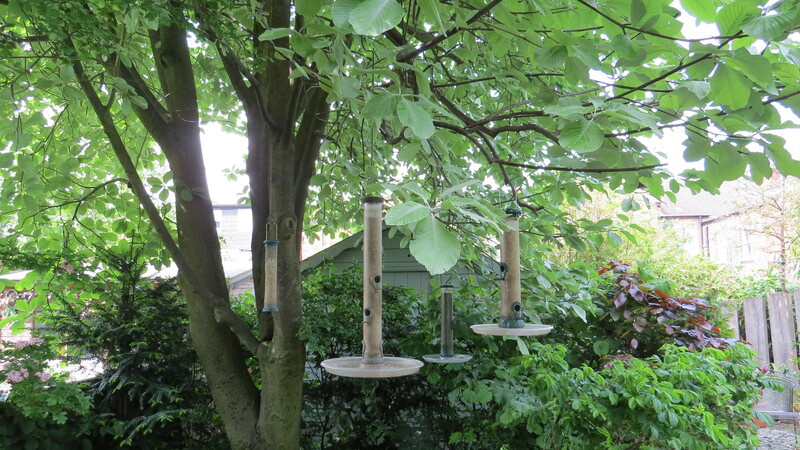 I also have a lot of bird feeders – 2 for seed, 2 for suet, 2 for nyger, and a bird table that looks as if it was cobbled together by Heath Robinson. 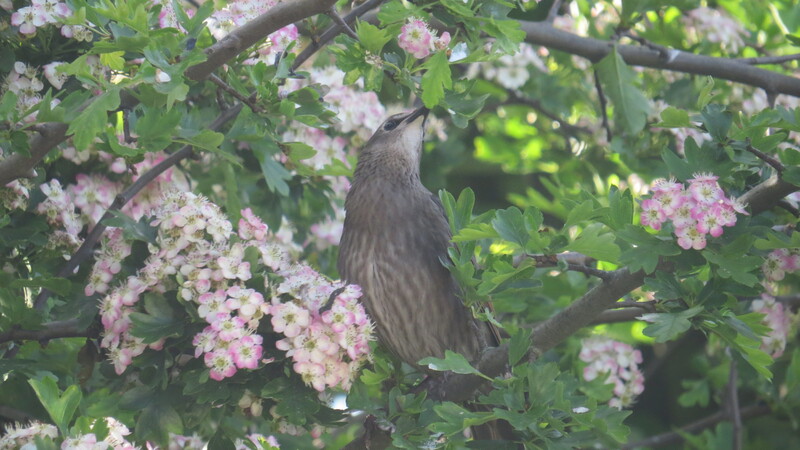 They’ve been very useful for attracting the birds into the garden, but I’m pleased to see that they spend a lot of time foraging for natural food in the trees and shrubs at this time of year. 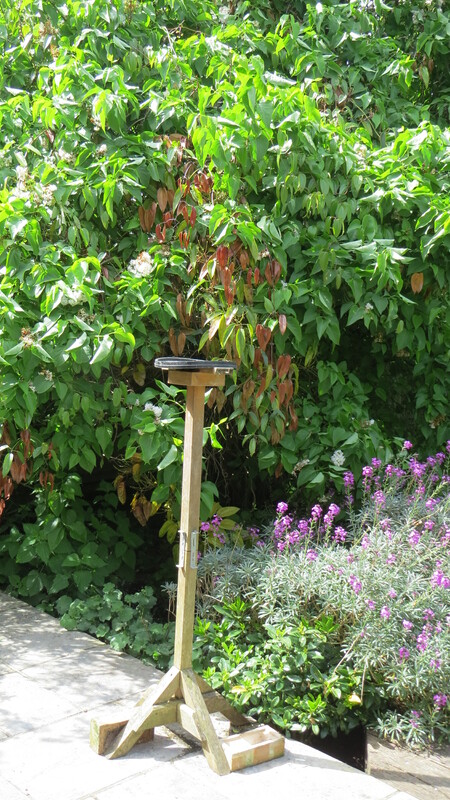 My Heath Robinson bird table in front of the rampant lilac bush and the Bowles Mauve. 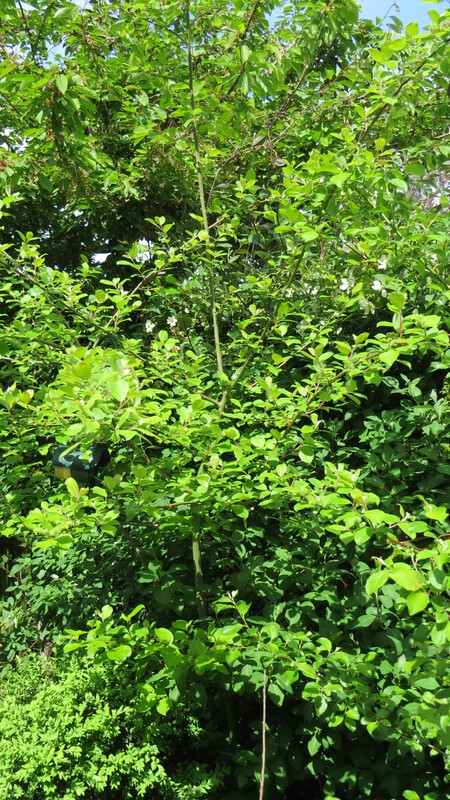 I’ve also managed to squeeze in a mixed hedge – yew, beech, hazel, hawthorn and spindle.I’ve been cutting this back in the autumn to encourage it to get thicker, but I think it will be a while before it gets thick enough for anybody to nest in it. 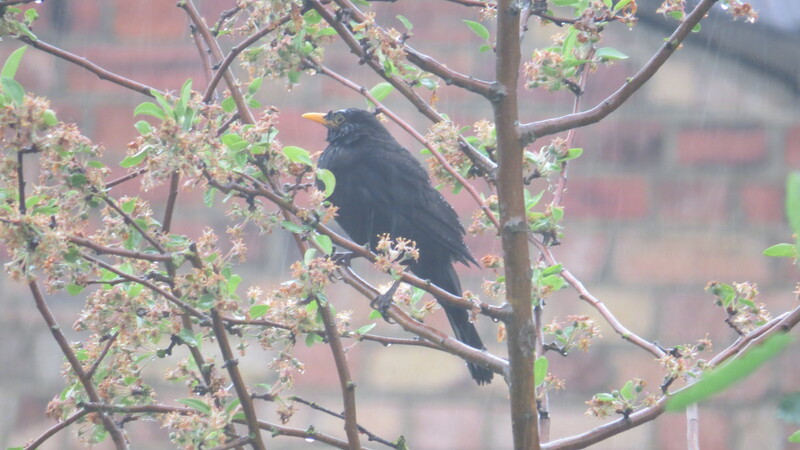 Again, it does much better in the part of the garden where it is not under the whitebeam. The poor spindle is nearly always eaten half to death by aphids, particularly (you guessed it) in the darker part of the garden. The hedge, looking back to the house. As you might expect, I am unfazed by weeds. 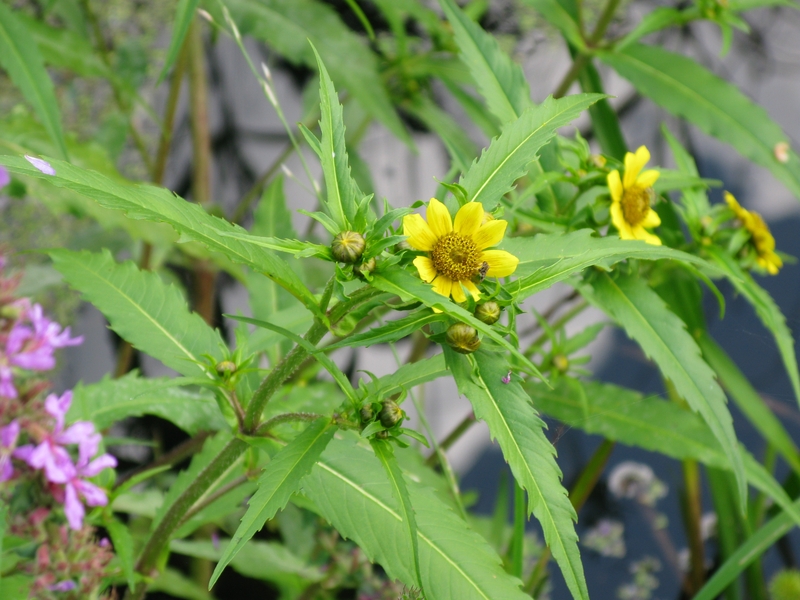 I have a wide variety, from the usual nettles and dandelions to comfrey, Mexican fleabane, pendulous sedge, herb bennet, yellow corydalis, green alkanet, forget-me-knot, and elecampane. I have a huge stand of Greater Willowherb which is so good for the bees that I can’t help letting it get bigger every year. 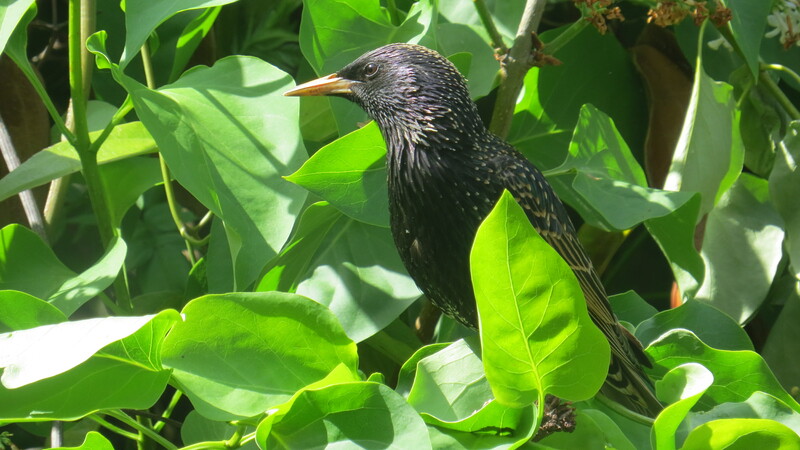 I have bramble and bindweed trying to find their way in from the back of the garden, and I do confess to encouraging these to curb their ambitions with a pair of secateurs. 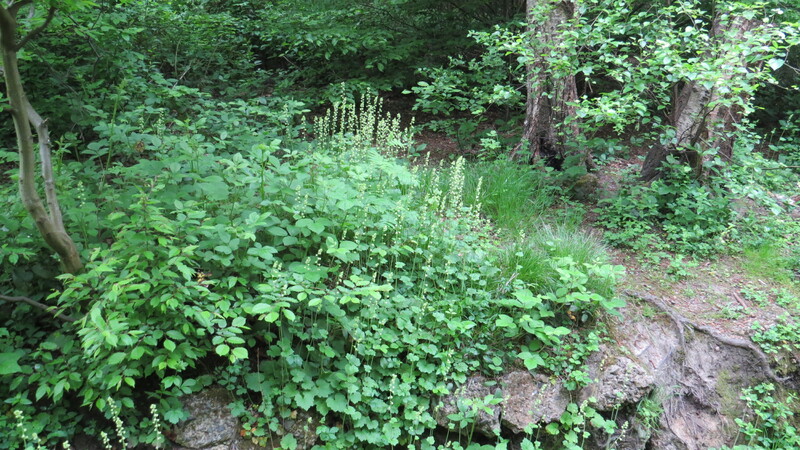 What intrigues me is that many of these plants can be found locally, in the wood or the cemetery, and I wonder how unique the mixture of ‘weeds’ is to any particular locality. Certainly, if something grows wild nearby, it is more likely to turn up. I have a view that, if not too ‘over-managed’, our gardens can become extensions of nearby habitat, rather than completely different ones. It makes sense to support the wildlife that is already living in an area, rather than asking it to adapt to a completely new set of plants. I also have an eight-foot tall volunteer cherry tree, courtesy of the one next door. My garden is becoming a forest. Of course, not everything in the garden is rosy. 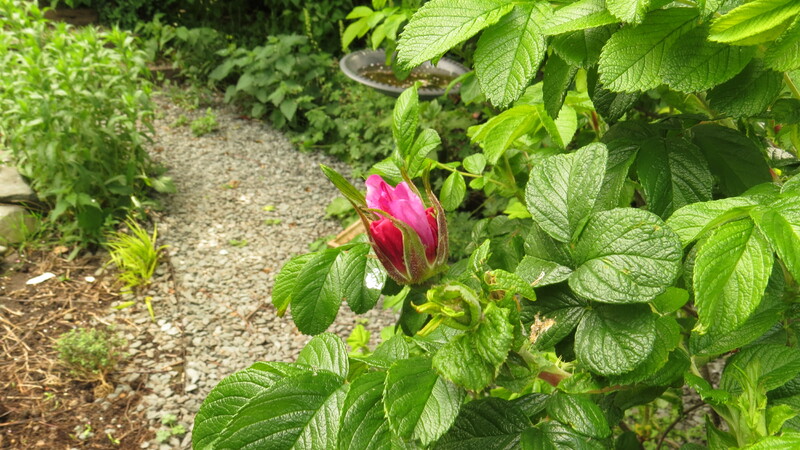 Especially the poor Rosa rugosa which I planted underneath the whitebeam in a moment of madness. 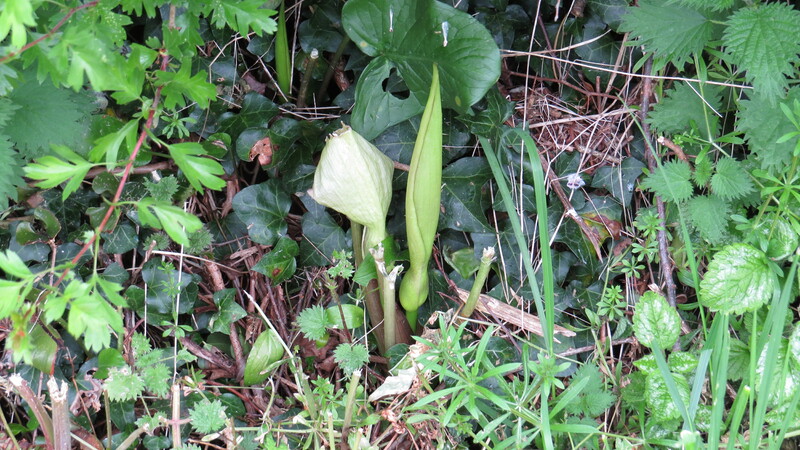 It reaches out with its poor attenuated stems for the sunlight and produces, oh, maybe three flowers a year. If I was a bit more confident about it surviving, I would move it, but now is obviously not the time. I am so lucky to have a garden again, and believe me, I am grateful every day that I have a chance to enjoy it. . There is always something going on, some new creature appearing or an unidentified plant popping up. But every garden is a work in progress. 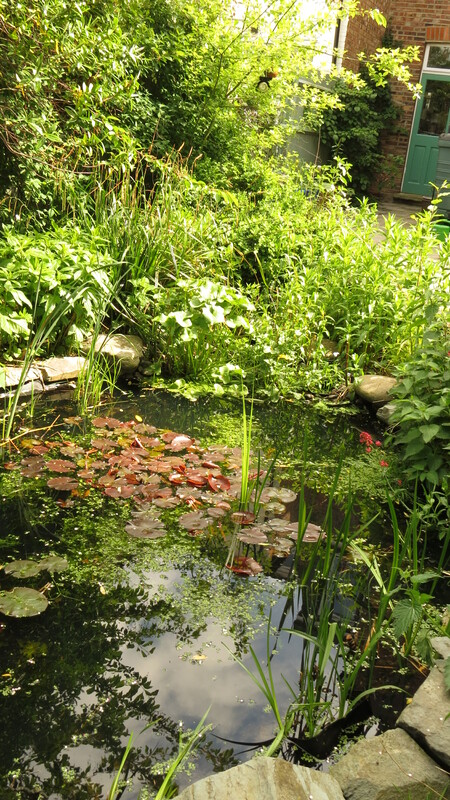 If you are also lucky enough to have a garden, what things have you tried that have helped your local wildlife? Do you have any advice on north-facing gardens, or working with heavy clay soil? If you don’t have a garden, have you tried containers, or guerilla gardening? Or what have you observed in your local park? I would love to know what your number one plant for pollinators is, for example, or if you’ve had any success with bug-hotels or nestboxes. 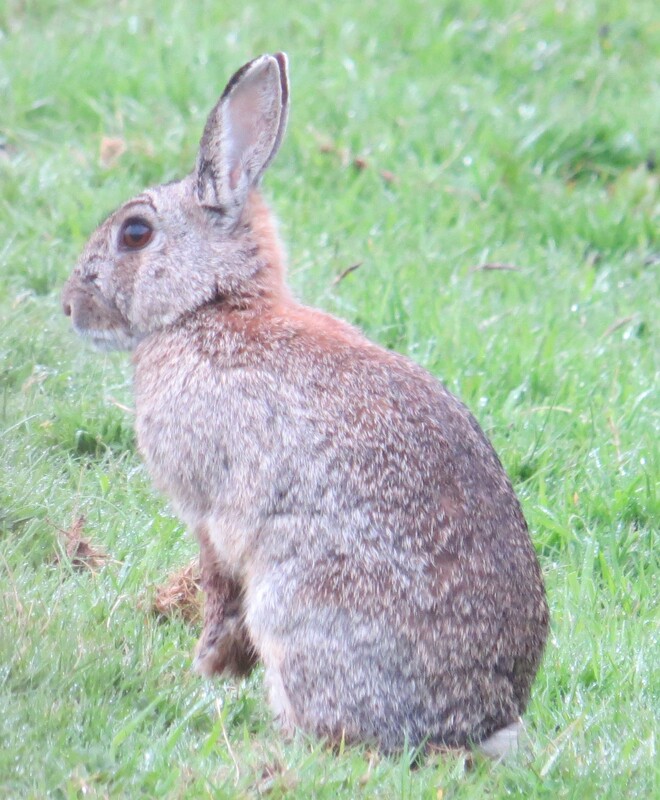 I truly believe that observant gardeners and dog-walkers and runners and allotment-holders have a deep pool of knowledge that should be tapped for the benefit of our wildlife, and that we have so much to learn from one another. 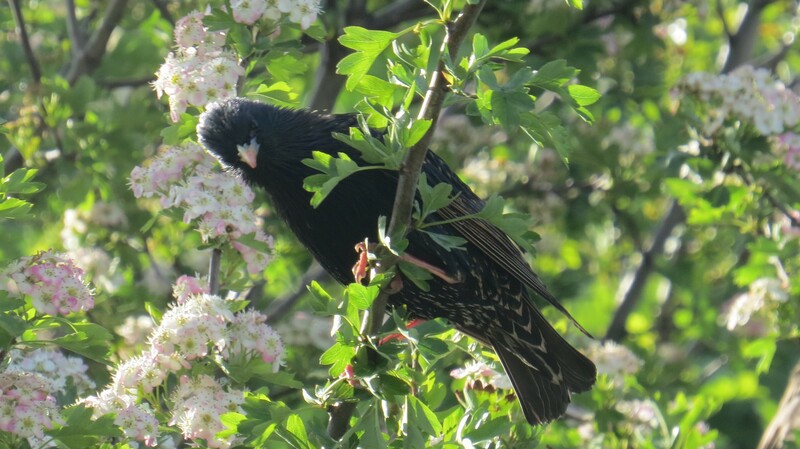 This entry was posted in London Birds, London Plants on May 16, 2015 by Bug Woman. 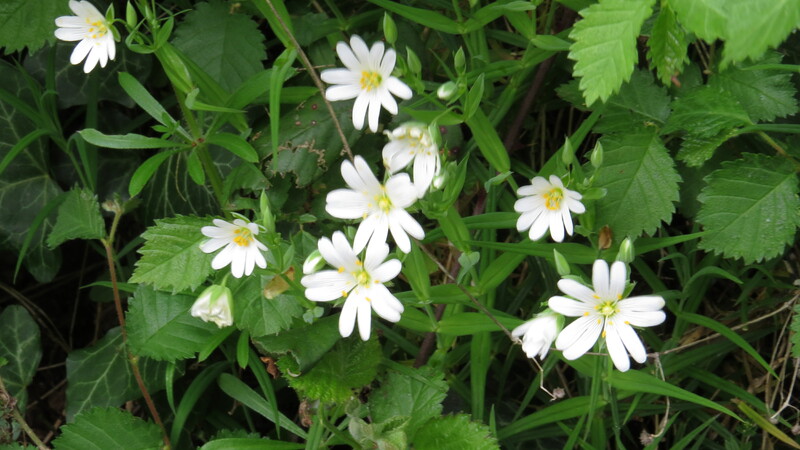 Dear Readers, a few weeks ago we had a look at Lesser Celandine, that delicate flower of shady woodland with the heart-shaped leaves and the daisy-like flowers. 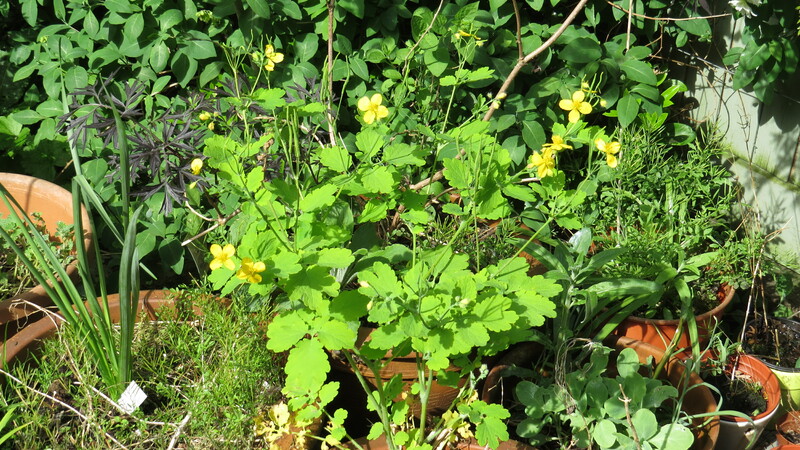 Today, the Greater Celandine is popping up all over my garden. 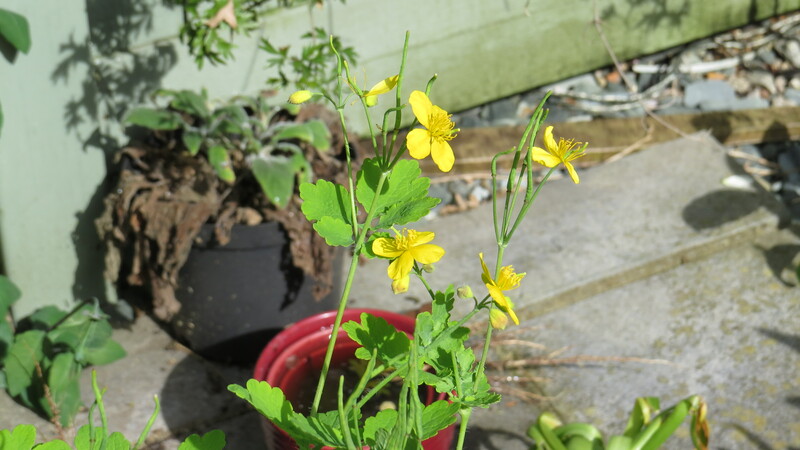 It has seeded itself in one of my terracotta pots, taken up residence by my side-door and is giving the Yellow Corydalis a run for its money in my side return. 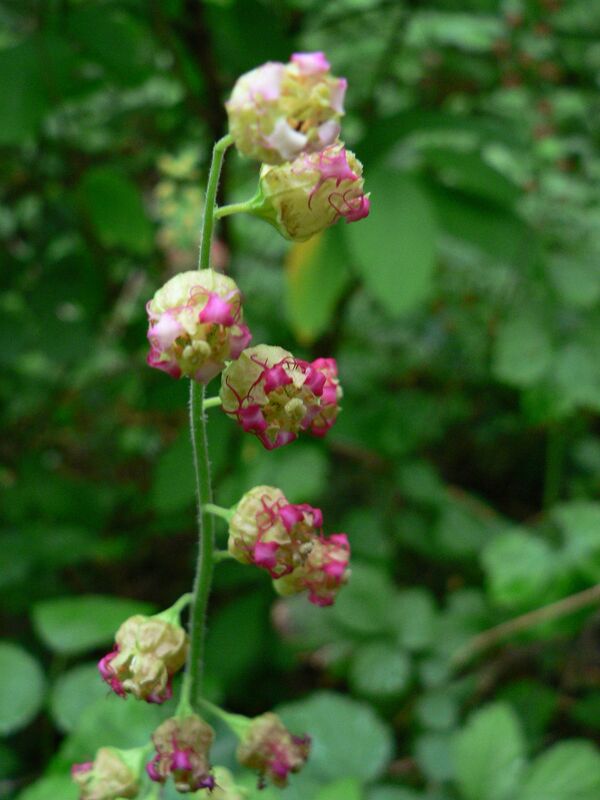 In short, this is a much bolder plant than its namesake, a plant of bright light and poor soil. 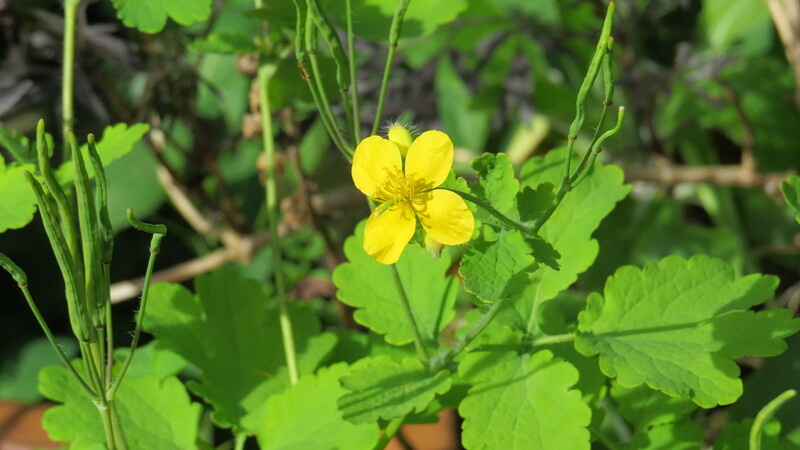 Lesser and Greater Celandine are from completely different plant families. Lesser Celandine is a buttercup, but Greater Celandine is a poppy. Like all of the poppy family, the plant has four petals. It also has a distinctive bright orange, latex-like sap, which is poisonous and irritating to the skin. The petals drop off at the mere touch of a hand, it seems, and the seedpods develop at a startling rate. What the latex is useful for, however, is the curing of warts. In Flora Britannica, Richard Mabey states that only Comfrey and Feverfew have more statements of efficacy from the people who contributed to the volume. 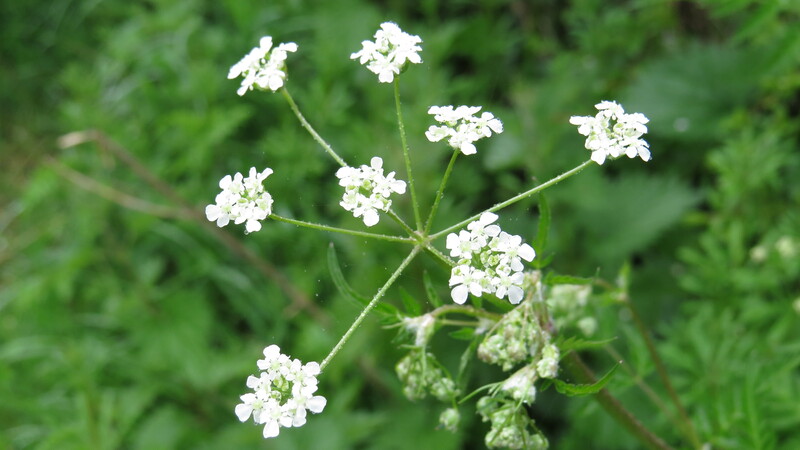 It has also been used for toothache (by no less a person than Queen Elizabeth I) and as a purgative. 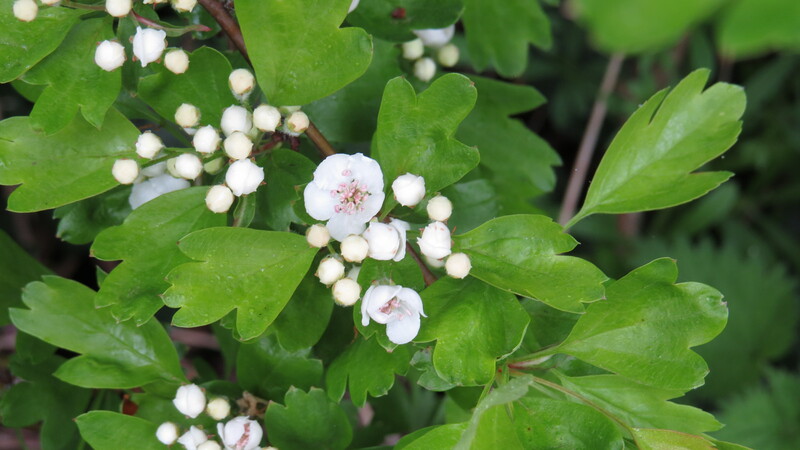 Under the Doctrine of Signatures (which we have discussed before, here and here), the bile-coloured sap was said to give an indication that the plant could be used for liver disorders. 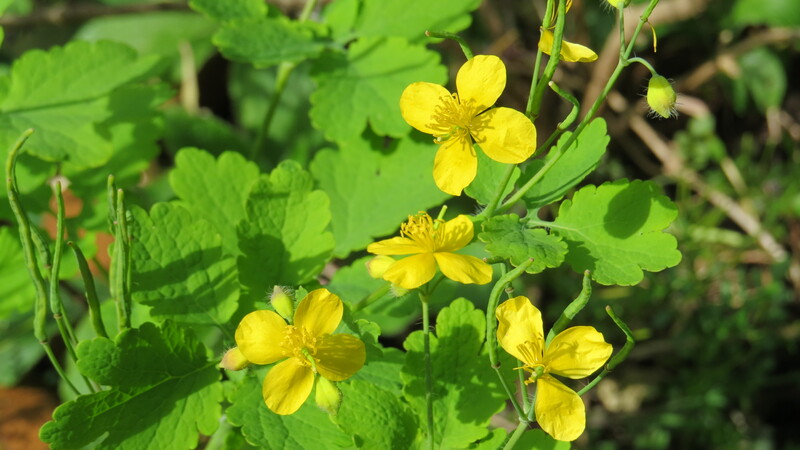 However, in 1999 ten people were admitted to hospital with acute hepatitis following the ingestion of a remedy made with Greater Celandine. This is an indication of the need to be extremely sure what you are doing before experimenting with the powers of the plant kingdom. 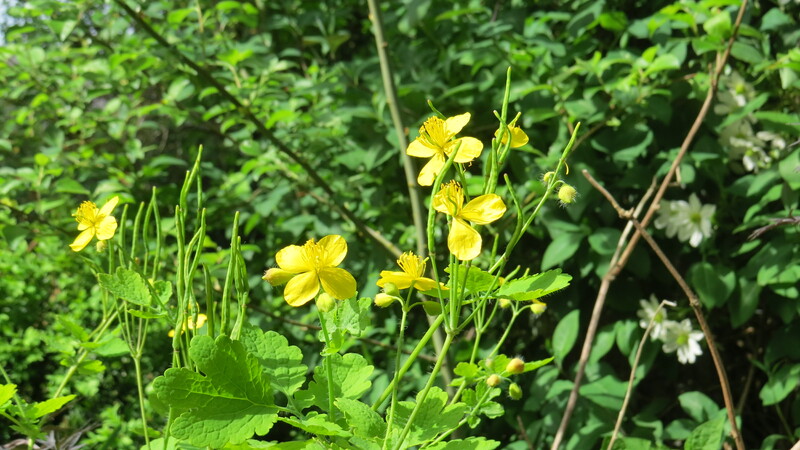 For all its long history of medicinal use, Greater Celandine is not a native plant: along with Fallow Deer, Horse Chestnuts and central heating, it is believed to have been introduced by our old friends, the Romans. However, it has made itself very much at home with us, and is seldom found far from human habitation, like a kind of floral House Sparrow. For reasons that escape me, it is the birthday flower for October 9th, by which time it will be well and truly asleep for the year. However, for the time being it is in its prime, and I advise any readers who have not had a good look at it to stop to admire its bright little face. It’s enough to cheer up any wait at the bus stop. 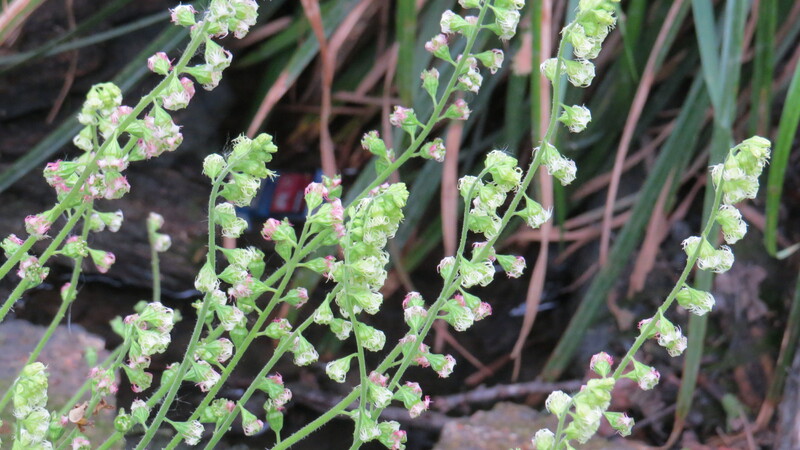 This entry was posted in London Plants on May 13, 2015 by Bug Woman. Dear Readers, when I was in Somerset last weekend, I decided to go for a walk along the hedgerow in Broadway, a village close to Ilminster. I have always been intrigued by these country paths – they hold such a mixture of plants and animals, and there is a kind of peace about them, a sense of their posterity. In this lane, for example, the level of the field is a good six feet above the level of the path, giving some idea of how it has been worn away over the years. 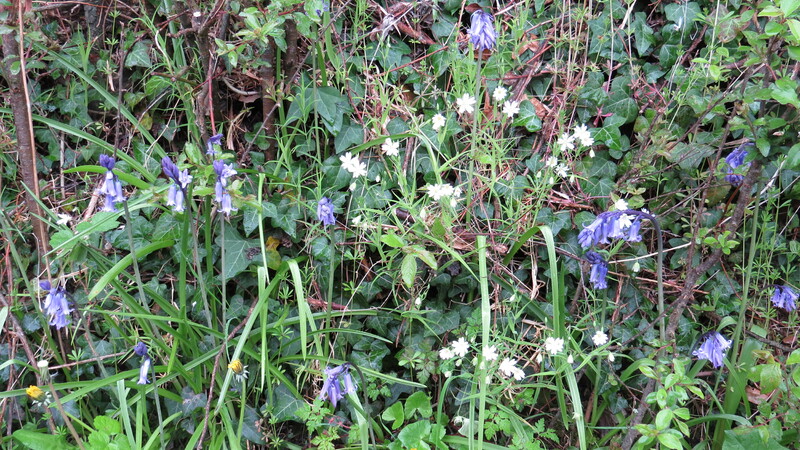 The plant community at the base of the hedge is a splendid mixture of cow parsley and bluebell, bush vetch and stitchwort, cuckoo pint and nettle. Rough Chervil. Or Cow Parsley. I should have checked the leaves…. 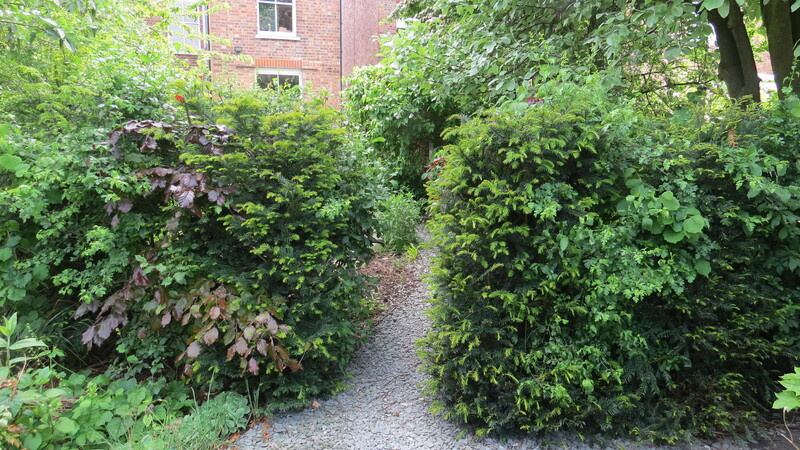 The hedge is hawthorn on one side, hornbeam on the other. It is tangled with honeysuckle and guelder rose. A tree has been allowed to grow at some points – this was largely as a reference point, for the days when people ploughed by horse. One of the trees is full of mistletoe. 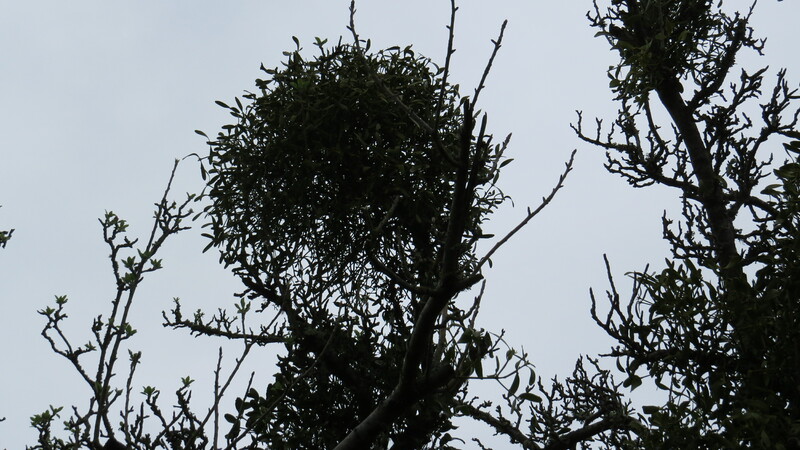 Mistletoe in one of the trees that have been allowed to grow in the hedge. 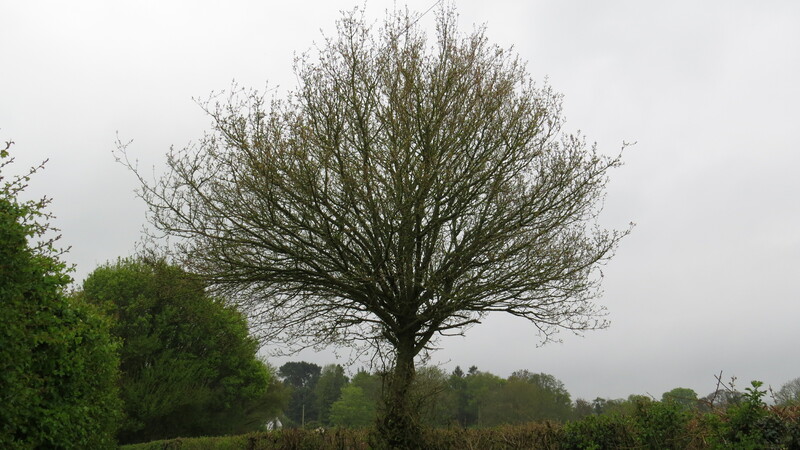 A tree that’s been allowed to grow in the hedgerow – maybe a ploughing mark? As I got to the bottom of the lane, the path passes a small cottage. This, my aunt Hilary tells me, is where the village cobbler used to live. The road was named ‘Paul’s Lane’ after him. I climb a dozen steps to look into the field beside the hedgerow. Here I see some creatures that I’m fairly sure don’t live in my half-mile territory back in East Finchley. When I was a child, I visited Wanstead Park with my little brother and parents. 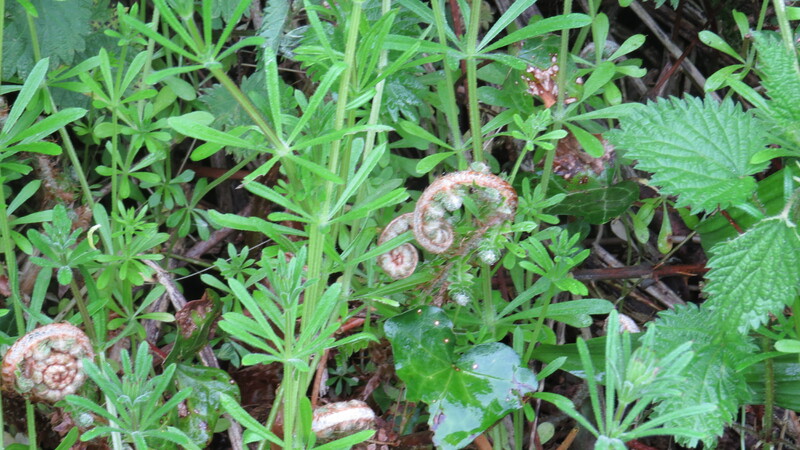 While we were walking through the wood, there was a rustling in the undergrowth. 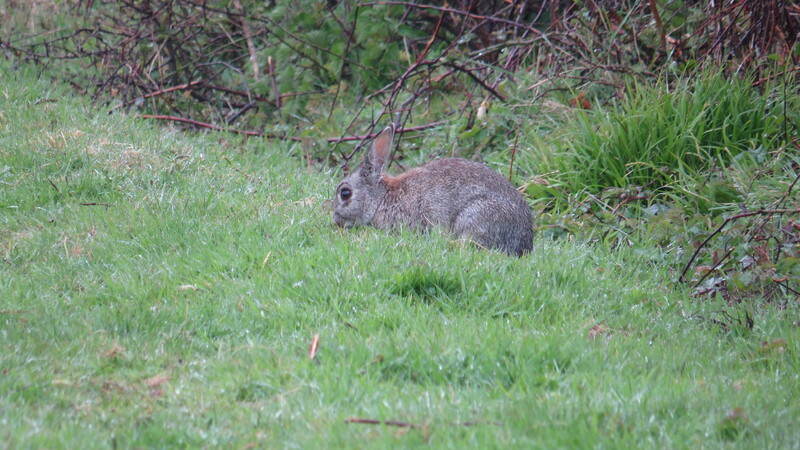 I stooped down to see a rabbit looking back at me. And right there and then I fell in love, not just with rabbits but with a world that has such creatures in it. It never occurred to me that a humble city child would be able to see such an animal, in the wild. Blessings on my parents’ heads for taking me out into the few unspoilt places that were available in East London. 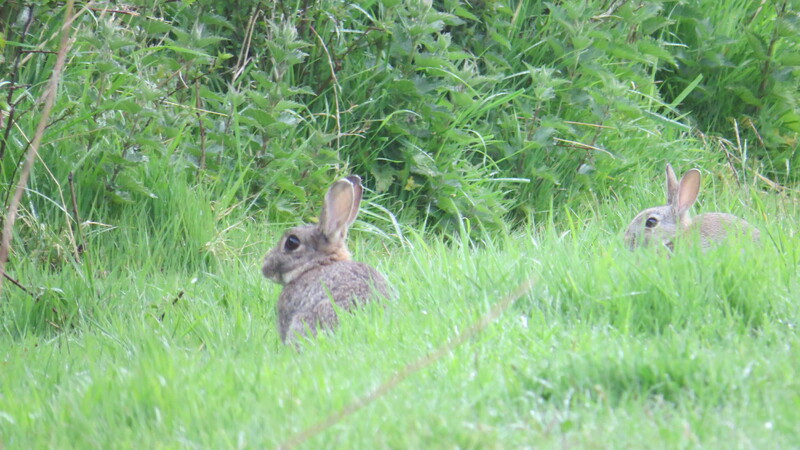 I still feel a little excited at the sight of a rabbit, even now. 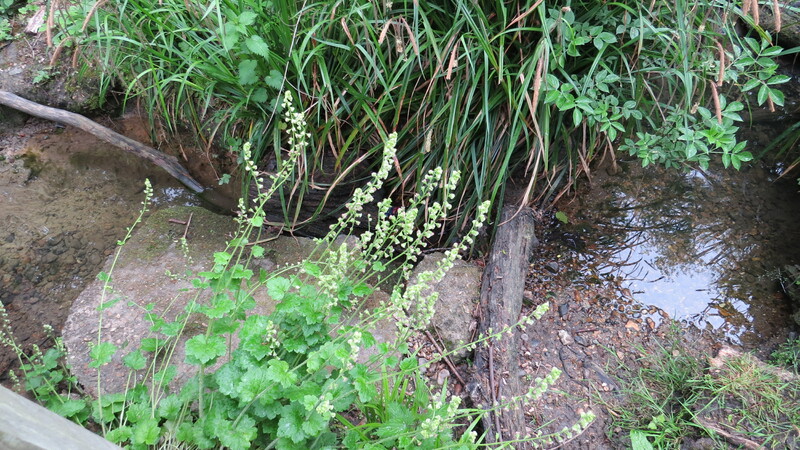 Just next to the field is the stream. 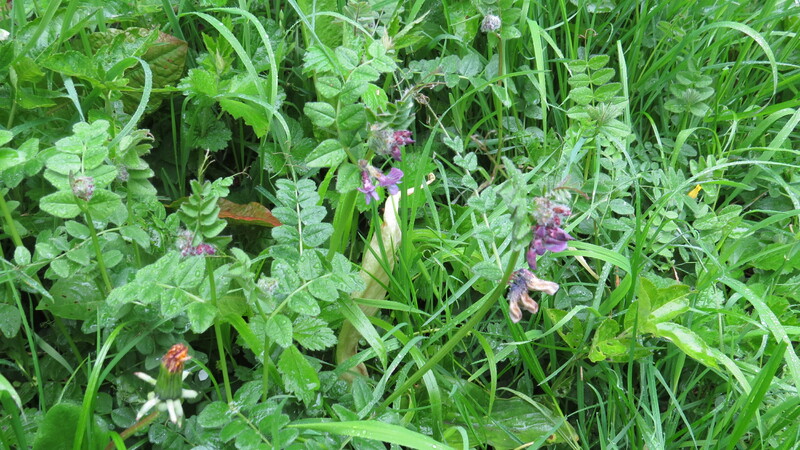 There is a corner of unspoilt meadow there, too small to grow anything on. 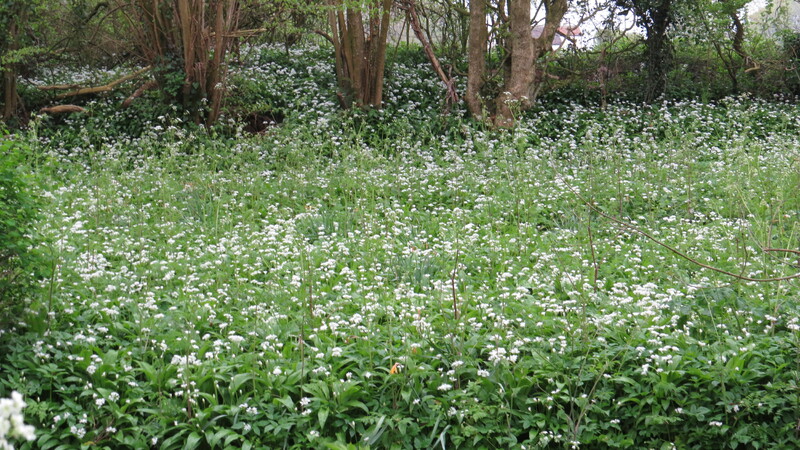 It was a riot of forget-me-nots and cow parsley and wild garlic. The stream is a temperamental creature. At this time of year, she trickles along, bothering nobody. 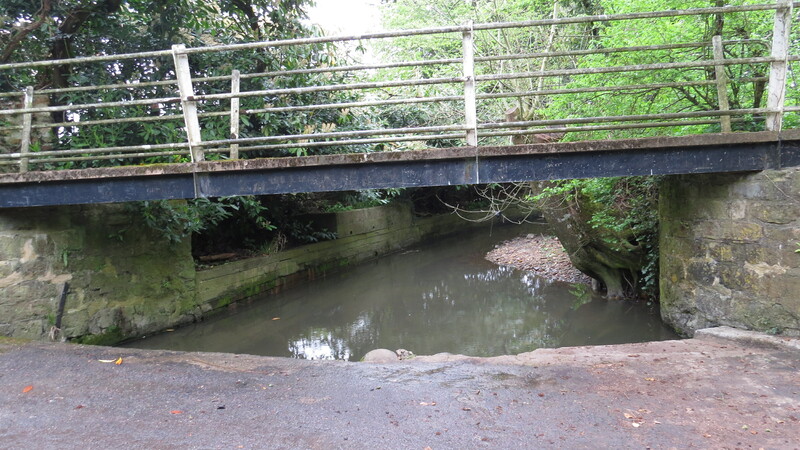 In a wet winter, the lower concrete part of the road is covered, and you have to use the upper bridge. Sometimes, even that is perilously close to being swamped. 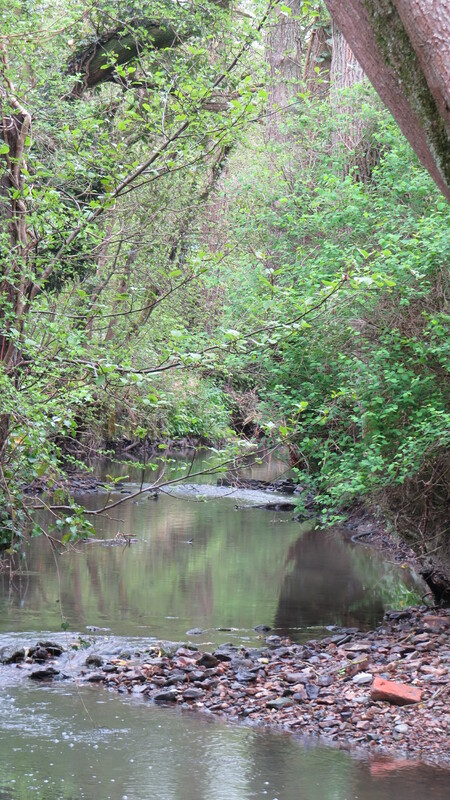 I looked up and down the stream in the hope of seeing a kingfisher. It seemed like a perfect place for them, but today it was not to be. Maybe another day. Now, the path enters the wood. 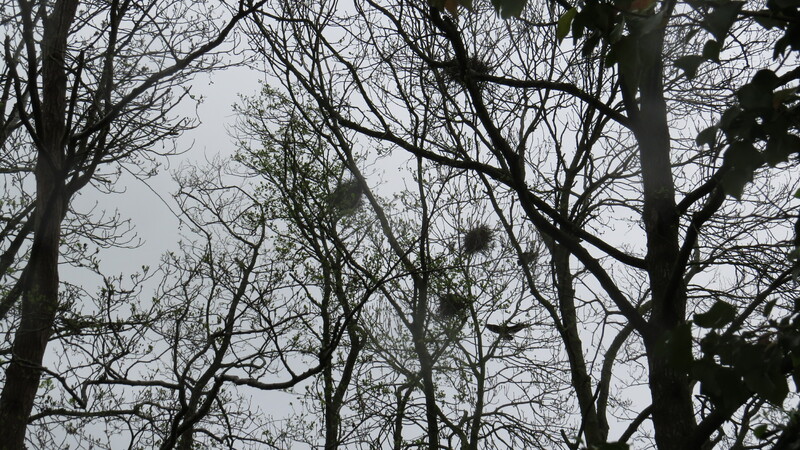 Already, through the trees, I could see the distinctive nests of the rookery. It was raining now. I tramped on, wiping the raindrops from my camera, though not altogether successfully as you’ll see from the film. The sound of the rooks was loud in the still air, and there was a constant traffic of birds flying in and out. One bird stole a stick from an unoccupied nest, and headed off to his or her own. 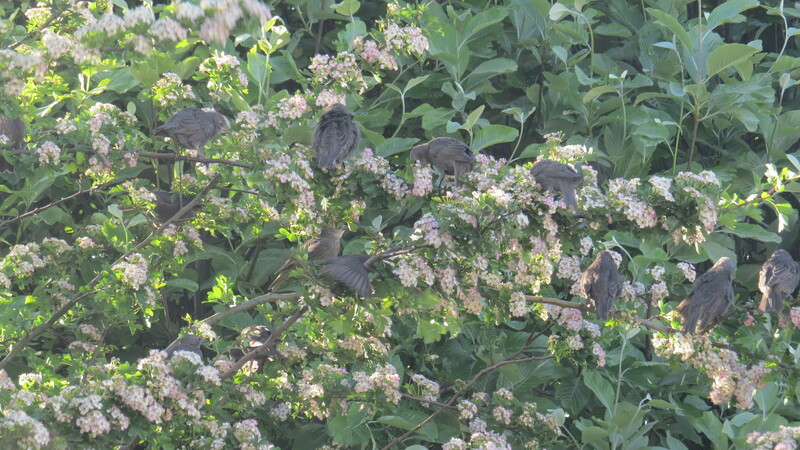 I wondered how long the rookery had been in place? In John Lister-Kaye’s recent book ‘Gods of the Morning’ (which I recommend), he tells of how the rookery on his land has been in constant use since at least the 1860’s. 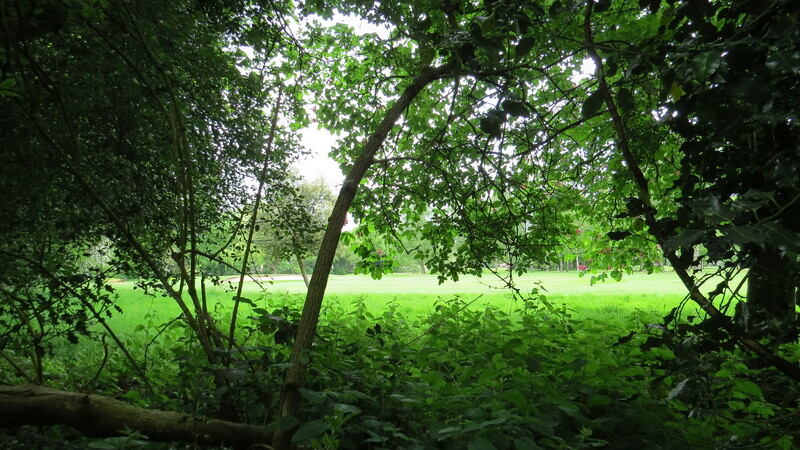 It will be here until some developer decides that the land is ripe for a crop of new houses, though the risk of flooding is maybe what has protected this little patch of ancient woodland so far. I walk past the rookery, remembering my very first visit to Broadway fifteen years ago. 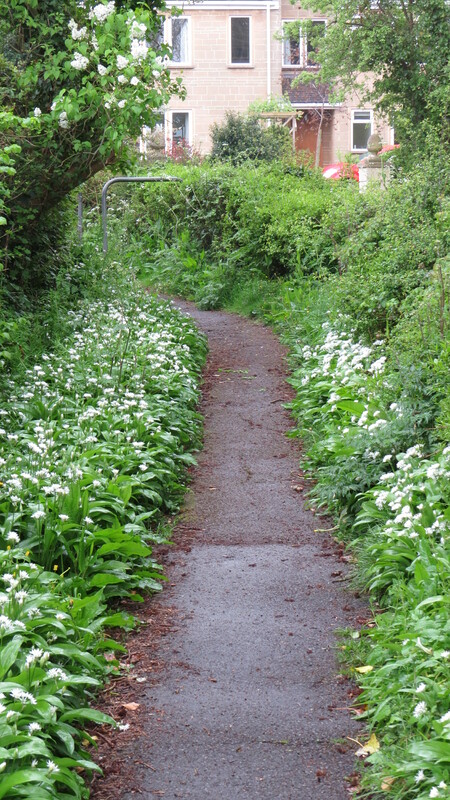 I walked along this path with my husband-to-be and was amazed by the smell of green garlic. It was a warm day, and the scent seemed to rise like mist from the plants on either side. I had truly never noticed Wild Garlic (or Ransons as they are sometimes known), but I could not avoid their presence here. Today, they are in full flower. I wish they would invent a way of putting smells on the internet, so that I could share it with you. And what a boon it would be to recipe websites! But I digress. For now, we’ll just have to look. A Somerset footpath. 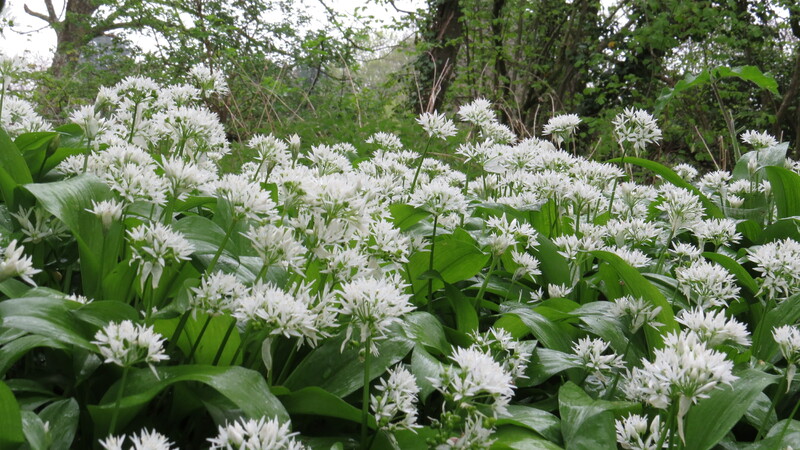 Look at all that wild garlic! The rain is coming harder now, so I head for home. It’s interesting the things that you notice when you reverse your direction. 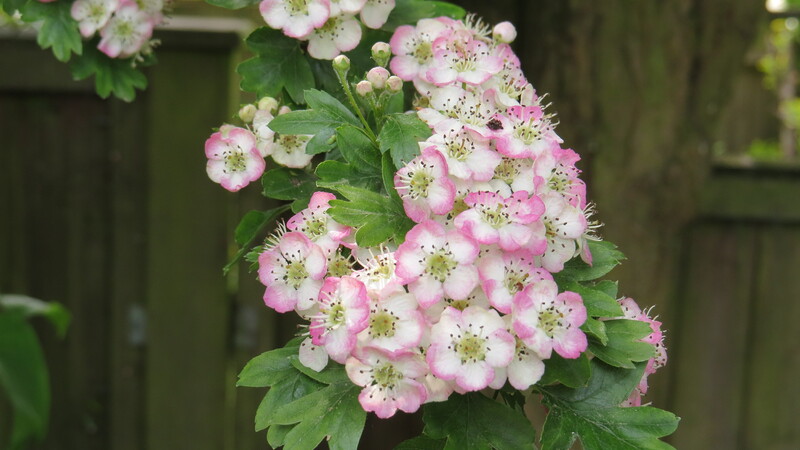 The first hawthorn flowers are bursting from bud in the hedgerow, and the ferns are unfurling. As the rain patters on the hood of my raincoat, I find myself looking forward to a cup of tea, and an hour’s knitting. 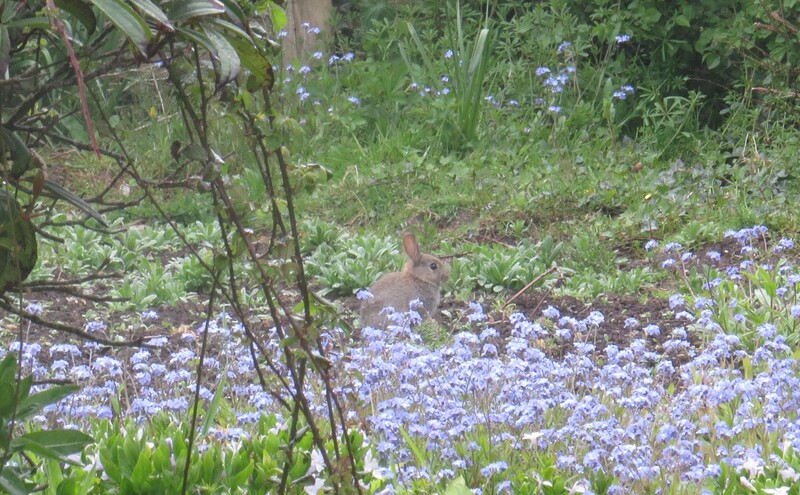 And, as I walk into the garden, I see one last rabbit, amongst the forget-me-nots. What a great way to end my expedition. 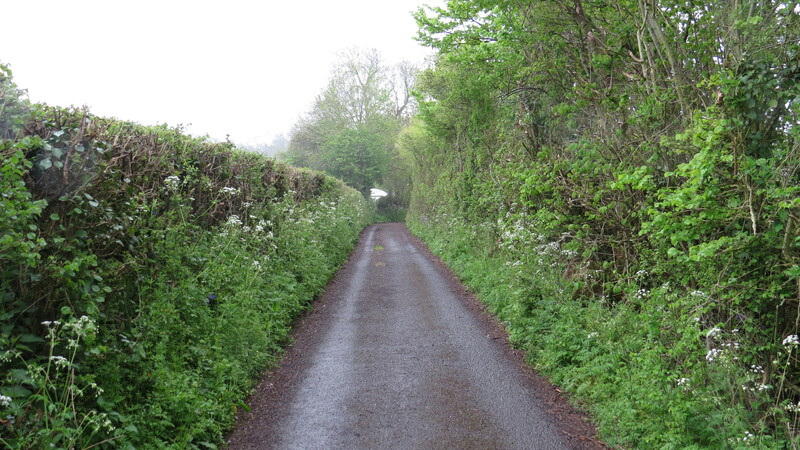 Dear Readers, since I took this walk in the lanes of Somerset, we have had a General Election. I believe that the party now in power is the most antithetical to the natural world that we have ever had . But this is no time to despair, for there is too much at stake. We will need to be vigilant, and vocal, and brave in defence of our communities, both human and non-human. We will need to work together, to learn from one another, and to listen. I do not know what our particular challenges will be, but I do know that we will need to be ready. 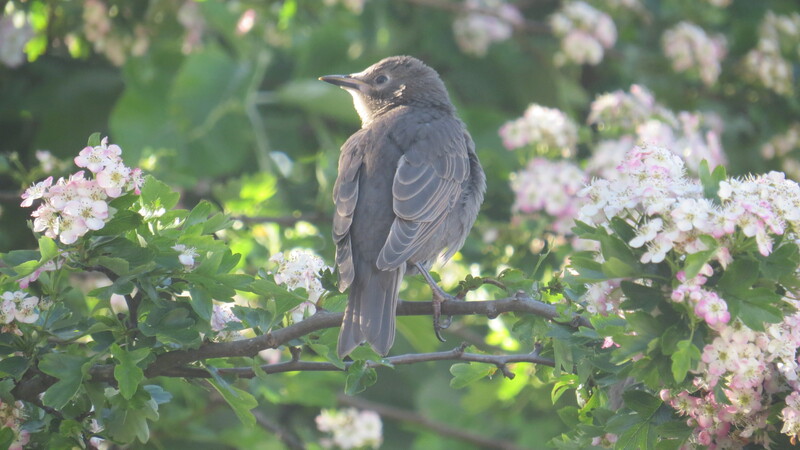 Our rookeries, our rivers, our hedgerows, our ancient woodlands, our city greenspaces and our little patches of wild flowers, our badgers, our foxes, our rare spiders and our dragonflies will not protect themselves. This entry was posted in Bugwoman on Location on May 9, 2015 by Bug Woman.